Dyers throughout Asia must have used a vast range of natural dyes in the past. Even today, dyers living around the foot of the Ile Api volcano on the island of Lembata claim to use 55 different natural dyes. Sadly the recipes for a large proportion of the historic dyes have never been recorded – centuries of human discovery and innovation have been lost forever. 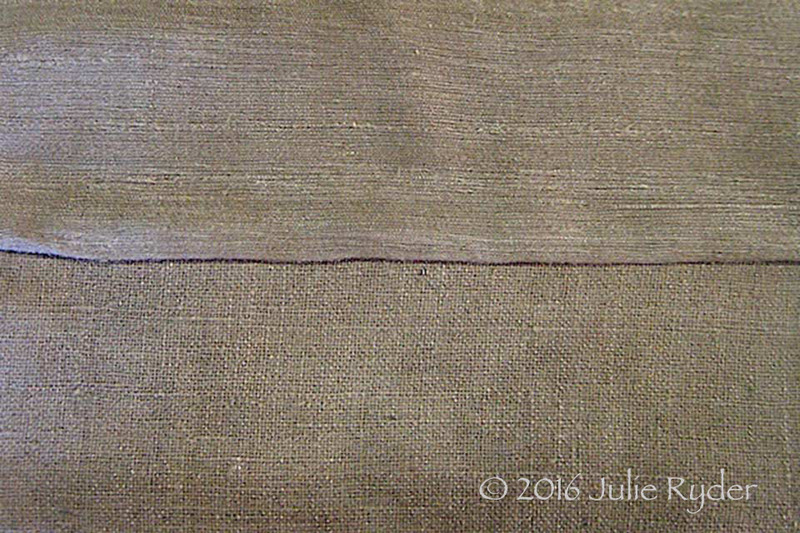 This is certainly the case with the natural brown textile dyes, only a handful of which are documented in the literature. Yet natural brown dyes can be extracted from an immense number of naturally occurring plants and trees, particularly those rich in flavonoids and tannins (Biertümpfel and Wurl 2009, 46). Trees are one of the most important sources of brown dyes, which can be extracted from their leaves, fruit, seeds, nuts, bark, heartwood and roots. In Europe and America the most common natural brown dyes were prepared from trees such as walnut, butternut, chestnut and oak as well as from their galls. Many tree dyestuffs contain tannins, a complex family of polyphenol chemicals that make good substantive dyes because they react with natural textile fibres to produce stable pigments without the need for metallic mordants (Cardon 1998, 73). They tend to produce shades of yellow, tan, brown, grey and black, depending on how they are applied and whether or not a mordant has been added. Obviously the greater number of repeat dyeings the greater the colour depth, while the addition of a mordant may not only change the colour shade - sometimes dramatically - but can also increase the uptake and therefore the intensity of the dye. 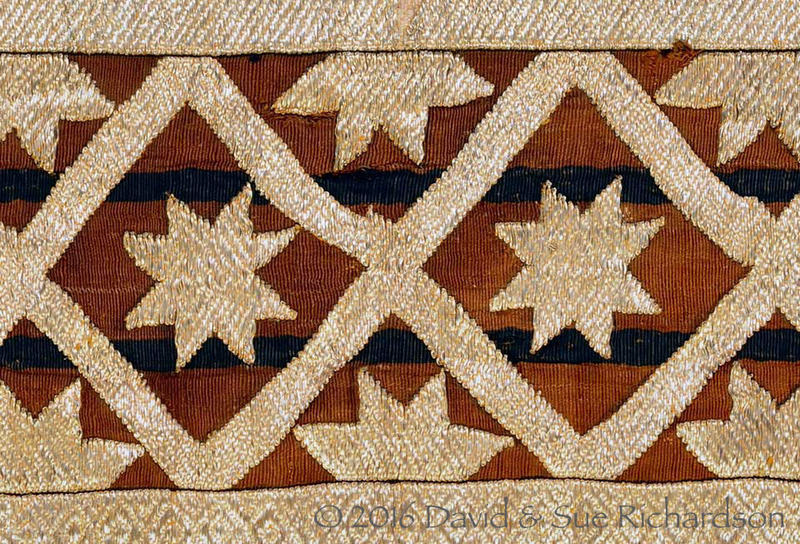 As one illustration, tan and brown shades were used extensively to insert warp stripes in the textiles used to make traditional tapis skirts in Lampung, Sumatra. 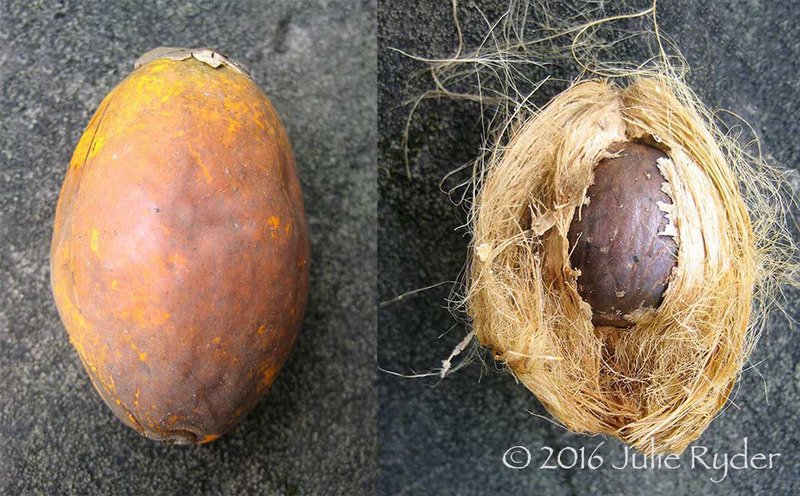 Brown dyes were extracted from the tree bark of the unidentified memoni and the durian (Durio spp. ), the stem bark of sepang (Caeselpina sappan), and the leaves and stems of salam, the Indonesian bay tree (Syzygium polyanthum)(Totton 2009, 42 and 44). One of the most commonly used natural brown dyes used across Indonesia was (and still is) morinda, which we cover in detail on a separate page. Depending on the complexity of the dyeing process, morinda can produce a range of shades from light pink and beige to dark red and brown. In the Lesser Sunda Islands, morinda tends to produce a rust brown or chestnut brown in regions such as Ende, Sikka, East Flores, Adonara, Solor, Lembata and Alor, all of which are located along the string of northern volcanic islands. However morinda produces red in the more southern limestone islands of Sumba, Savu, West Timor and Semaru. The reasons are not entirely clear. The achievement of a deep morinda red depends on rigorously pre-treating the yarns by repeatedly steeping them in a mix of oil and alkali, thoroughly drying them in between. It seems that in locations such as Lembata, this process is not as intensive as it is in places such as Savu or East Sumba. Another factor could be the chemistry of the local water supply. On the volcanic islands dyers tend to use water from mountain streams, whereas on the limestone islands of Savu and Sumba they use water from lowland streams - and in the dry season from wells and boreholes. The former is likely to be acidic and rich in salts containing sodium, potassium, chloride, sulphate, and silicate ions. The latter is likely to be alkaline and much harder, with salts composed of calcium, magnesium, carbonate, bicarbonate, and to a lesser extent sulphate ions. We know that the active pigment of morinda, morin, forms quite different complexes with smaller ions such as sodium than it does with larger ones such as calcium. Having said this, dyers in Tenganan Pegringsingan on the volcanic island of Bali, produce a morinda tone that is not brown but a deep orange-brown. The local Bali Aga historically invested a long time in the initial oiling process, and also added tannin to the morinda root in the form of kihip bark – see below. This may explain why their morinda is redder than that found on the volcanic islands further east. 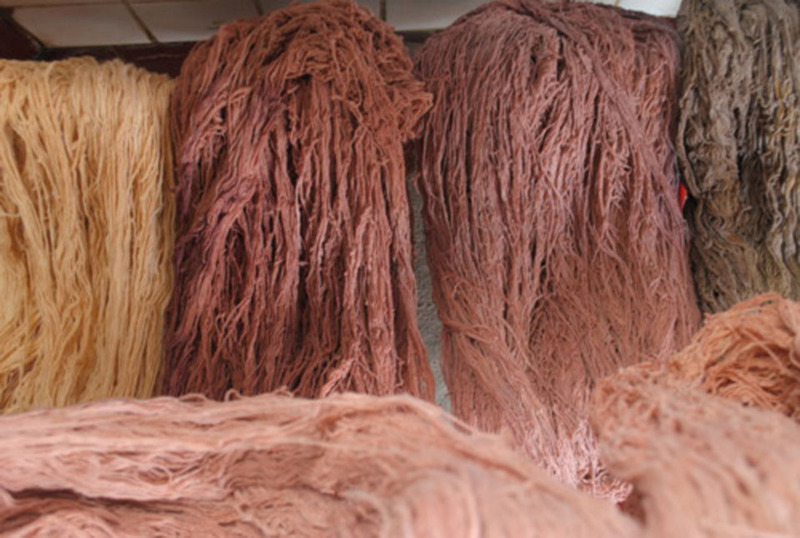 Regional colour difference may also depend on whether dyers add other ingredients to the dye bath, or finish the dyeing process with some form of post treatment. Thus at Ndona they add jackfruit to the final dye bath to deepen the reddish-brown colour, while the Endenese gave their morinda yarns a final immersion in a hot dye bath containing morinda, sappan and Symplocos in order to achieve a browner shade (Cunningham, Maduarta, et al 2011). In Sikka some dyers added the bark of rawamatan, while at Doka they add mango and jackfruit bark. In West Timor, Amarasi dyers completed the morinda dyeing process with an after-treatment of sappanwood and tree lichen (Bühler 1948, 2499). An extreme case is found among the Kemak of Marobo in East Timor, who completely transform their morinda by overdyeing it with tannin to produce a dark brown (Cunningham, Kadati, et al 2014, 96). This makes very little sense chemically, so it has been proposed that there could be ritual reasons for dyers to conceal the conceived potency of red. In some regions a reddish-brown dye is obtained from the bark of the Indian mangrove, Ceriops tagal, also called the yellow or tagal mangrove, and probably also from the very similar and closely related flat-leaved spurred mangrove, Ceriops decandra. 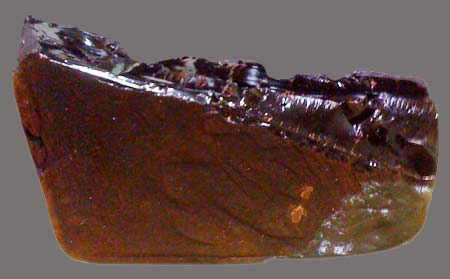 Ceriops tagal is the same species as C. candolleana and C. timoriensis. The Indian mangrove is a salt-tolerant species common in mangrove forests throughout much of the Indo-Malaysian region. It occupies zones in the inner mangrove, often growing on gently sloping tidal mudflats along sheltered coastlines, estuarine deltas and saline creeks. It forms broad monotypic stands in relatively elevated places just above sea level – places that are only flooded during the spring tides. Its sister species, Ceriops decandra, more often grows in the lower tidal zone mixed with other mangrove species such as Brugiuera and Rhizophora (Tomlinson 1994, 355). Indian mangrove is a tropical species that is widely distributed from the coasts of eastern Africa and southern India into Southeast Asia, the Philippines, Indonesia, the north coast of Australia and the western Pacific. It is an evergreen shrub or tree with a single trunk, slender stem, stilt-like roots and shiny leathery leaves. It normally grows up to 6m in height, but can sometimes reach 15m or more. Seedlings drop like darts to lodge upright in the soft mud or float to another location to germinate. Initial growth is very rapid and can reach an incredible 60cm in 24 hours! The flat-leaved spurred mangrove, on the other hand, has a straight columnar trunk supported by stout flanged buttresses (Quattrocchi 1999, 897). Indian mangrove (Ceriops tagal) is known as madame in Burma, smae or smerkrohorm in Cambodia, prong, prong daeng or samae in Thailand, tengar or tengah in Malaysia, and tangar, tengar, tingi, tingih, palun, parun or bido-bido in Indonesia (Giesen, Wulfraat, Zieren and Schlten 2006, 703; Quattrocchi 1999, 897). In Sarawak it is called tengar or tengar samak, the Iban sometimes shortening this to just samak. In Gorontalo, Sulawesi, it is called tanggala tutu. In Indonesia the term tingi was also applied to Ceriops decandra, formerly called C. roxburghiana (Jasper and Pirngadie 1916, 40). In Banyumas, south Central Java, tingi was known as menjéré. According to Jasper and Pirngadie, in some other places it was wrongly called soga tingi or soga menjéré. 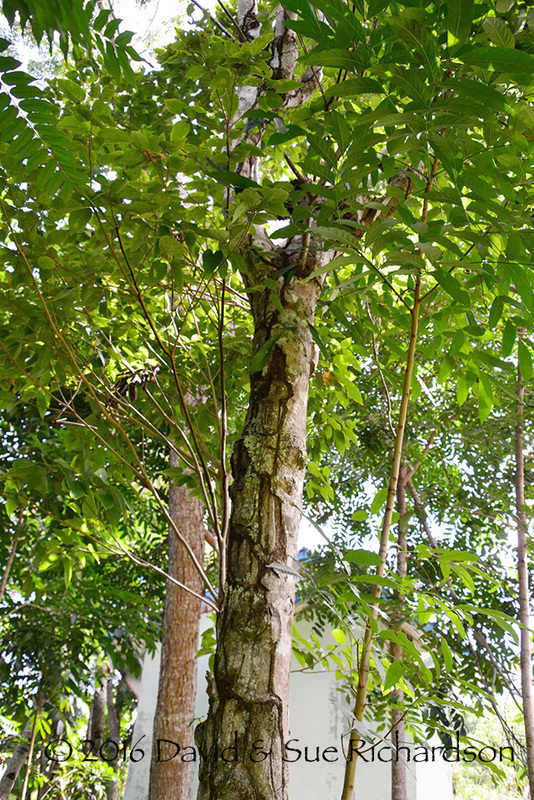 The Malays seem to apply the general term samak to a number of trees with tannin-producing barks, including Myristica elliptica and Syzygium rosulentum, all of which produce a brown dye and are used for tanning fishing nets to prevent them being rotted by seawater (J. of the Society of Dyers and Colourists vol. 9 1893, 215; Sutlive and Sutlive 2001, 1482). In the early nineteenth century these samak trees were cut down and stripped of their bark, which was then exported from Singapore to China (Asiatic Journal vol. 19 1825, 424). The barks of several other mangrove species were used to produce brown dyes. One was the wild rose apple (Syzygium pycnanthum), which was called kelatasam and kelat jambu in Malaysia and jambon and jambu kappa on Java (Janick and Pauli 2008, 560). 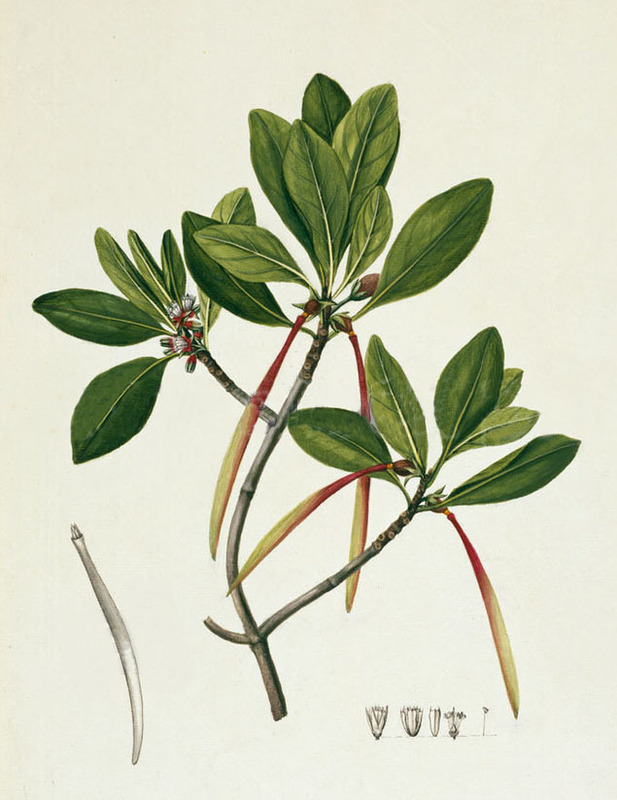 Another was the Asiatic or red mangrove (Rhizophora mucronata), known as bakau in Malaysia. The bark of Ceriops tagal is very rich in tannin, although the concentration can vary enormously – from 13% to over 40% (Manudu and Bandeira 2005, 54). Dyers prefer the bark of older trees because tannin content increases with age (Manudu and Bandeira 2005, 55). The bark is peeled off by hand in strips and can be used immediately. It is simply pounded, soaked in water and then squeezed to release the dye. Mostly the mixture is boiled. Sometimes the Ceriops bark is mixed with barks from other mangrove species. The leaves contain roughly 15% tannin and can also be used as a dye. It is likely that many other mangrove barks were used to produce brown dyes in the past. 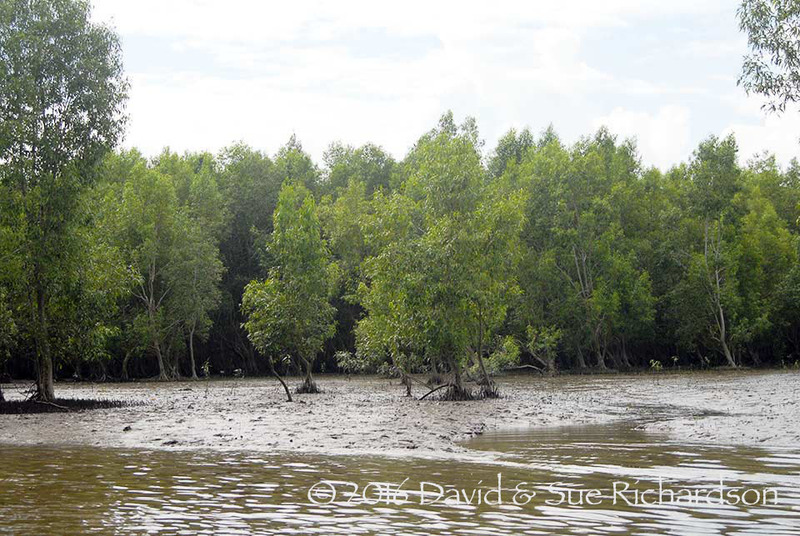 A recent study in Jambu District on the north coast of Java revealed that light to dark brown dyes could be made from the leaves and stems of six mangrove species: Agriceros sp., Avecenia sp., Ceripos decandra, Lumicera sp., Sorenasia alba and Rhizophora sp. A combination of the bark and leaves of Agriceros sp. and Lumicera sp. produced the strongest and brightest colours (Pringgenies, Supriyantini, Azizah, Hartati, Irwani and Radjasa undated). In Cambodia a brown dye was obtained from the bark of a tree called smae, a term that seems to have been applied to both Ceriops tagal and C. decandra (Green 2003, 56). On Borneo the bark of the mangrove or samak tree was used by the Iban to make a rich reddish-brown or brick-red dye (Hose, McDougal and Haddon 1912, 222). 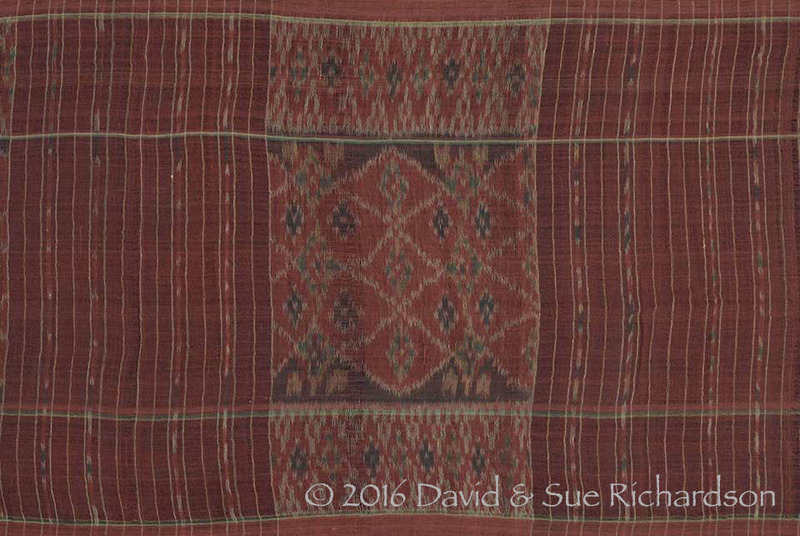 It was apparently a favourite of the women from Saribas, who were said to make the best local ikat (Haddon and Start 1936, 19). 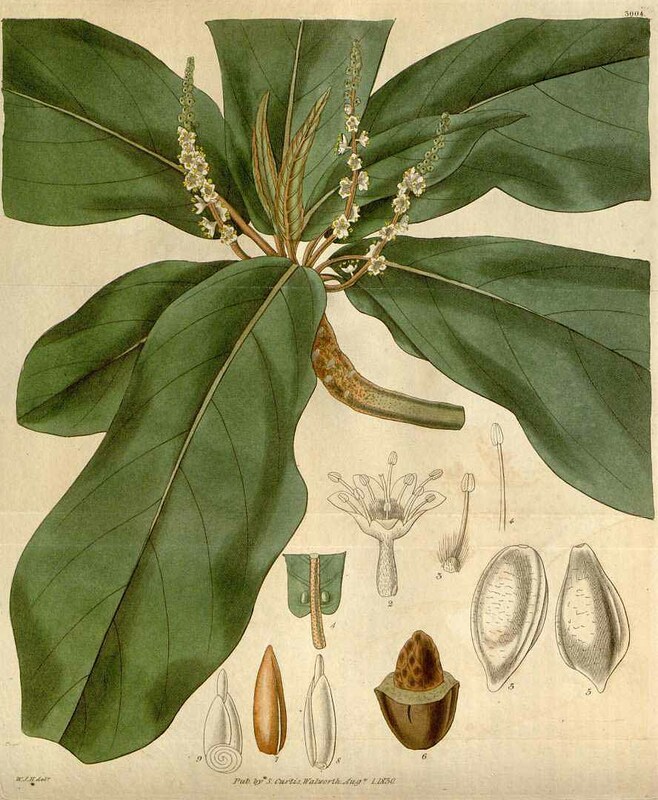 On Java mangrove bark was used in some regions to dye batik, and may have been harvested from various species which probably included Ceriops tagal and others (Heringa 1989, 116). The bark was given a variety of names such as kayu tingi, kayu tengar, kayu katia and bakau (Heyne 1927, 1165). Although tingi could be harvested from tidal forests throughout Java, one of the most important supply centres was on Pampang Bay in Banyuwangi at the easternmost end of the island (Jasper and Pirngadie 1916, 40). 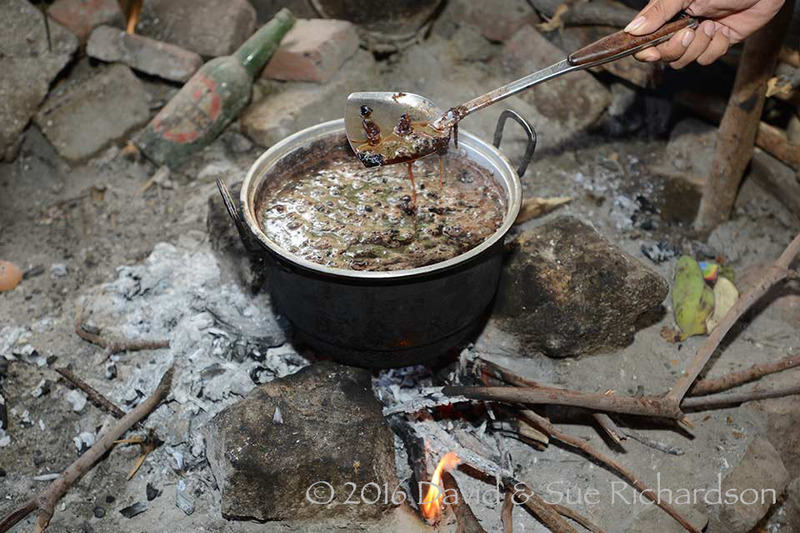 To prepare the dye, the bark was soaked overnight and pounded before being boiled in water, after which the liquor was strained off and allowed to cool. Instead of dipping the batik into the bath, the dye was rubbed and evenly spread into the batik with the flat of the hand (Heringa 1989, 118). In Kerek on the coast of East Java rough chips of kayu tingi bark were purchased from the market at Gresik, some 60km distant, having been imported from other parts of Java or from Sulawesi (Heringa 1989, 116). Tingi was probably also used in other parts of Java - kayu tingi was recorded as being sold in the Tuban region in the late nineteenth century. Tingi was also used on Java as an overdye for indigo, possibly a way of speeding up and reducing the cost of the indigo dyeing process (Jasper and Pirngadie 1916, 34). The process was still being used along the north coast of Java in the 1980s, where it was known as nyoga (Heringa 1989, 124). Around Melolo, East Sumba, the bark of the mangrove Rhizophora apiculata has been used as a less preferable alternative to morinda when the latter was not available (Astuti, Hidayati, Munawaroh and Wightman 2001). One of its local names is kayu douga. The bark is chipped off and pounded, then soaked in water. 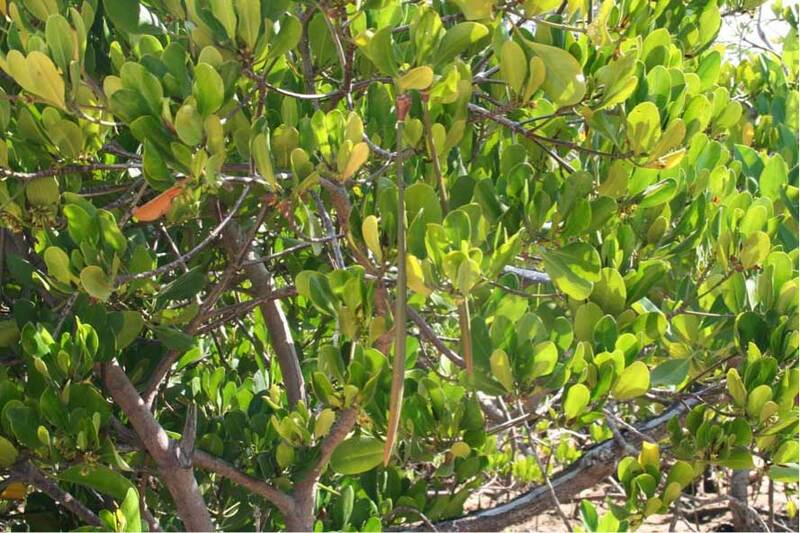 In the coastal regions of Timor the barks of flat-leaved spurred mangrove, Ceriops decandra, and Asiatic or red mangrove, Rhizophora mucronata, were used to produce brown. The former was known in the Tetun language as klenuk, and the latter as katene (Cunningham, Kadati, et al 2014, 96). Timorese dyers also used the bark of red-tipped ru, Casuarina junghuhniana, a tropical tree that grows on salt marshes and hillsides throughout East Java and the Lesser Sunda islands, especially on Timor (Faridah Hanum and Van der Maesen 1997, 90-91). The tree is called bau ayo by the Uab Meto, kakeu by the Tetun, bur by the Bunak and ai-gou by the Kemak (Cunningham, Kadati, et al 2014, 96). Of all three species, dyers apparently prefer Ceriops decandra. The bark of Indian mangrove (and most probably other related species) is one of the three components used to prepare the traditional Javanese batik dye called soga, which produced a warm brown colour ranging from a light yellowish tan to a deep chocolate brown depending on the mordant used. See below. Many shades of brown can be obtained from the areca nut, the ovoid-shaped seed of the tropical areca nut or betel nut palm, Areca catechu. Areca nut combined with lime and the leaf and/or catkins of the Piper betle vine has been widely used throughout large parts of southern Asia as a narcotic chew. The Areca genus contains 76 or more species of small understorey palms, which are distributed from India, through Southeast Asia and the Malaysian/Indonesian archipelago, into the Pacific (Kurian and Peter 2007, 29-30). The genus is most diverse on Borneo. It appears to have originated in the general region of Borneo, Sulawesi and the Malay Archipelago and was introduced into the Indian subcontinent in antiquity (Raghavan 1957). The most well-known species is the taller Areca catechu, a graceful erect unbranched palm tree that can reach up to 20m in height. It thrives at low altitudes in moist tropical climates. Areca is known in Malaysia as pinang and in Indonesia as pinang, jambe or pua (Quattrocchi 1999, 369). In Hindi and Bengali it is called supari. The fruit of the Areca is a one-seeded berry, surrounded by a thick fibrous outer layer. The unripe fruit is green and becomes reddish-yellow as it ripens. Each branch of the palm bears from 100 to 250 fruits (Prabhakaran Nair 2010, 6). In Indonesia the bunches of fruit are cut from the tree and the individual fruits separated and husked. Green unripe fruits are generally preferred for chewing. The nuts of the Areca catechu contain carbohydrates, protein, fibre and fat along with from 17 to 30% polyphenols – flavonols and tannins (Jayalakshmi and Mathew 1982). However immature nuts can contain up to 38 to 47% tannin – the percentage decreases as the nuts mature (Morton 1992, 753). The tannin content consists of gallotannic acid and catechins (Raghavan and Baruah 1958; Daniel 2006, 38). Pinang can be used to produce many shades of brown. It was used by the Ibans of Sarawak to produce various shades of dull brown (Haddon and Start 1936, 10 and 19). The chopped pinang was first dissolved in boiling water containing wood ash, and the yarns immersed from half an hour to one hour for light brown and overnight for dark brown. The colour was developed by the addition of liquor obtained from wood ash. Dyers in Lampung, south Sumatra, used young pinang to produce a red dye (Totton 2009, 42). With a mordant of aluminium pinang produces a slightly pinkish light brown. 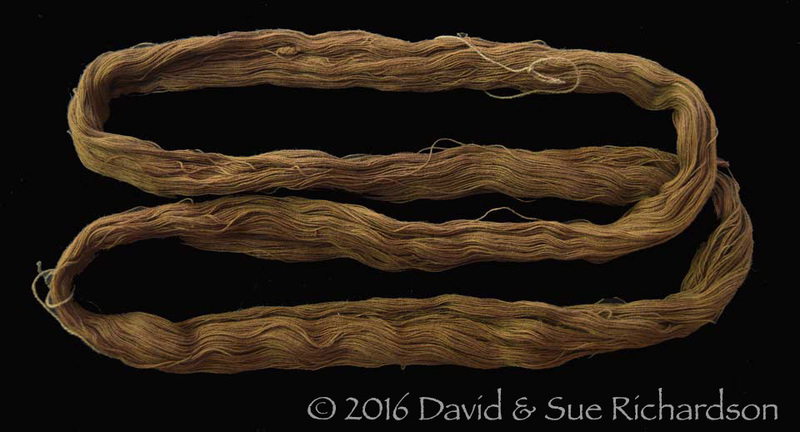 Brown dyes made from the nut or the chewed leaves of areca seem to have been widely used to colour bast fibres in New Guinea (Bühler 1948, 2495). 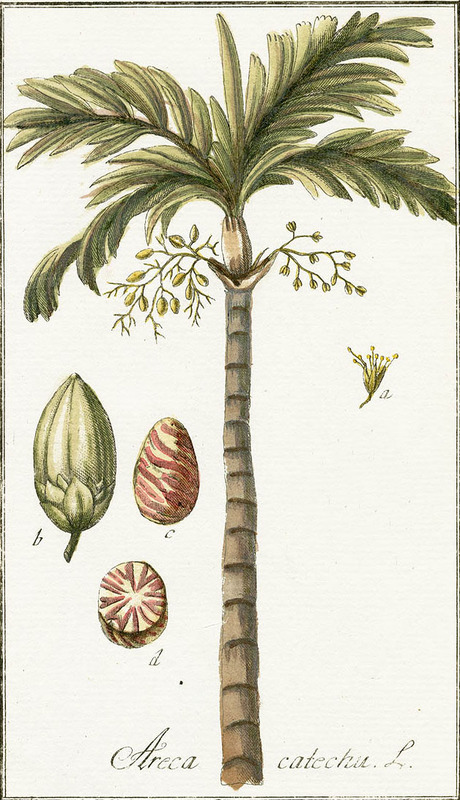 There are brief reports indicating that Areca has also been used as a dye in Laos, Malaysia and on Bali. It has also sometimes been used as a mordant for other dyes. In Lampung, Sumatra, a red dye was extracted from the young pinang fruits before they had hardened into nuts (Totton 2009, 42). A reddish-brown dye has been produced from the bark of the Areca in Laos (Pha Tad Ke Botanical Garden, Luang Prabang, 2010). Dyers in Burma and Kalimantan used its heartwood to produce a dull brown dye (Fraser-Lu 1988, 31). In Laos they also produced a brown dye from the tree bark of sisiad, Pentace burmanica, which was used for chewing as a substitute for areca nut (Tagwerker 2009, 98). Alkaline lye was added to the dye bath. In both India and Burma an important traditional brown dye for cotton was extracted from the heartwood of the cutch or khair tree (Acacia catechu). Cutch is a small thorny tropical tree with fern-like leaves that forms impenetrable stands. It is distributed from India to Southeast Asia and Indonesia. However it seems to have been introduced into the Malay Archipelago by the Dutch during the nineteenth century (Kathirithamby-Wells 2014, note 107). It was introduced into Timor in the 1930s (Djogo 1994, 378). Although a dye called cutch was also produced in Sarawak, Brunei and Dutch Borneo, this was actually a substitute made from mangrove bark. 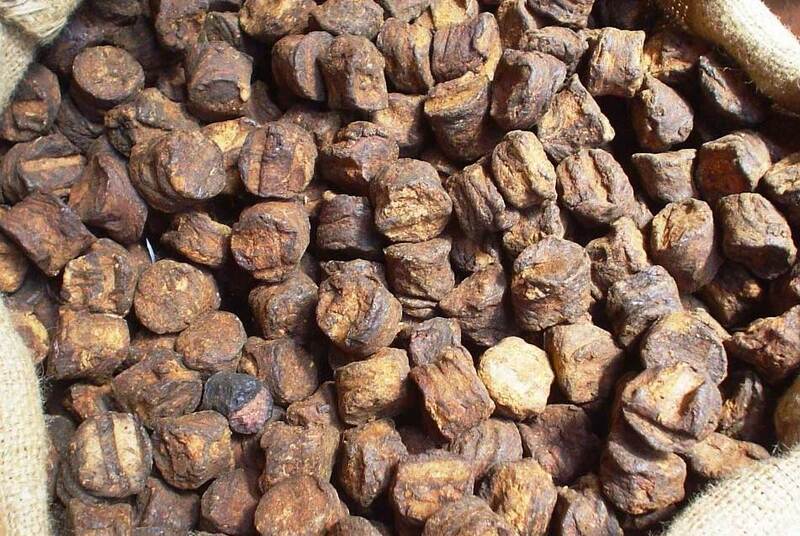 True cutch, also called black cutch and catechu, is a gum resin extracted from freshly felled Acacia catechu trees. To make the dye the heartwood is chipped and then boiled in earthenware pots for three or four hours (Pandey, Pandey and Chadha 1993, 541). The brown liquor is removed and more water added until the heartwood is exhausted. The liquors are filtered and then concentrated by more boiling before being left in the shade to cool. After two days the curd-like precipitate (known as kattha) is removed and poured into wooden frames, cut into tablets and dried in the shade. The remaining liquid is further concentrated by boiling and stirring in an iron pot until it forms a syrupy mass of cutch. The cooled extract is spread out in shallow wooden trays and left to dry overnight. When dry it is cut into smaller cakes (Shah and Seth 2012, unnumbered pages). About 100kg of Acacia chips produce 5kg of kattha (used as a betel-like chew) and 14kg of cutch, which is regarded as a by-product. Solid dark brown cutch or catechu contains around 25-33% catechu-tannic acid, 2-12% catechin, 20-30% gummy matter, and smaller amounts of catechu-red and quercetin (Shah and Seth 2012, unnumbered pages). 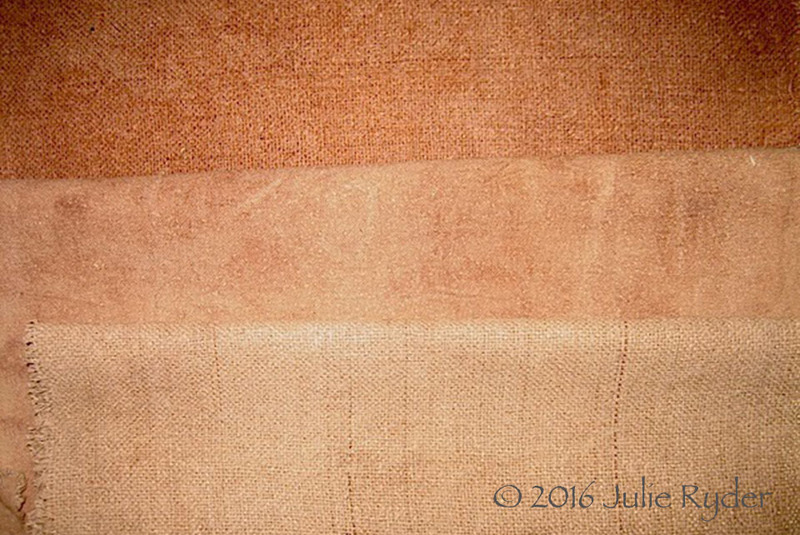 Black cutch produces a beautiful brown dye on cotton and silk, ranging from fawn to mid-brown, olive, and khaki. It can be used directly, or with an aluminium mordant, but requires oxidation in air. With an iron mordant it produces grey or black tones. The dye is very fast and was used to dye Indian calicos for centuries, finally being adopted by European dyers after 1800 (Liles 1990, 174). It seems to have been imported from Singapore, Java and the East Indies as well as Peru. 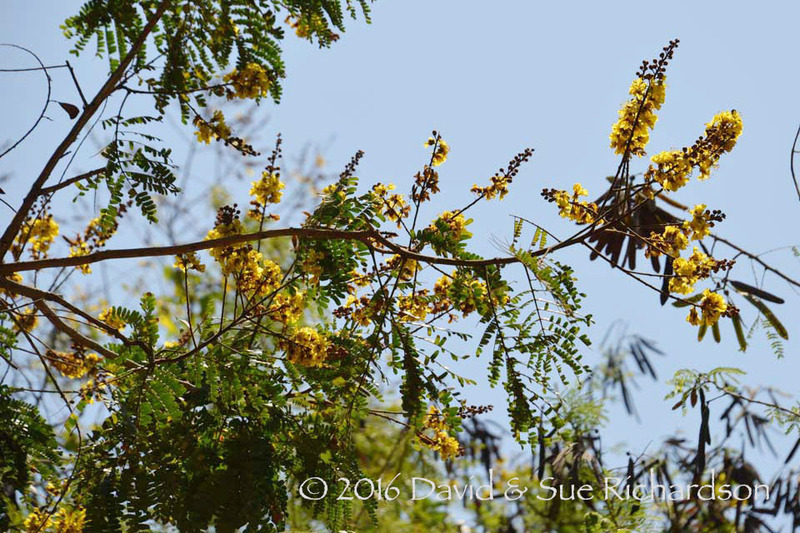 In Burma, cutch extracted from the wood of Acacia catechu - known locally as the sha tree - was one of the main dye products (Danda 2004, 843). Local cutch boilers recognised four varieties of local Acacia catechu, distinguished by the colour of their bark and heartwood, namely sha ni, sha wa, sha bya Kyaung mwe and sha net, red, yellow, blue and black cutch respectively, red cutch being considerd the best (Dautremer 1913, 250). Trees were stipped of their bark and outer wood and were cut into logs before finally being chopped into small chips. These were then boiled in water in an earthenware pot, the resulting liquor being transferred into iron caldrons where it was constantly stirred and concentrated. Once thickened, the cooled resin was finally poured into leaf-lined brick moulds to set. 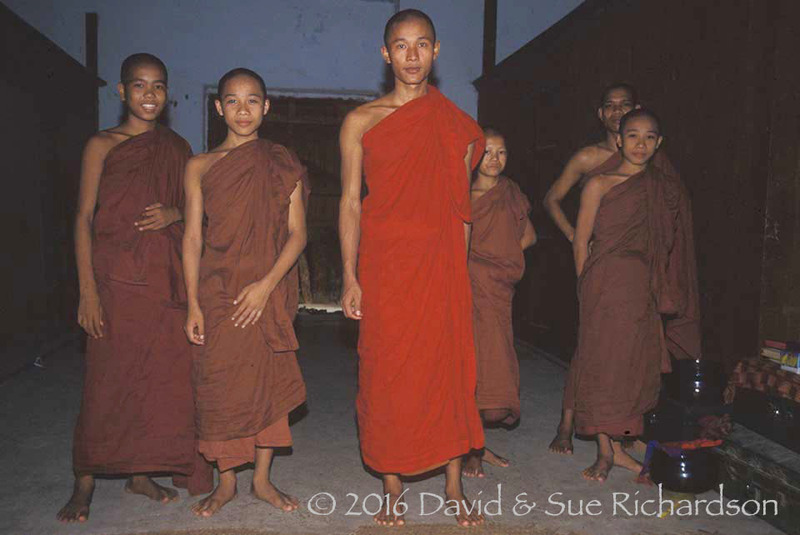 One of the local uses was for dyeing the yellowish-brown robes of Buddhist monks. The extraction of cutch had already become an important Burmese cottage industry by the middle of the nineteenth century (Bryant 1997, 92-95). Cutch-boiling was a particularly important livelihood for poor villagers in the Prome and Thayetmyo districts of Lower Burma (Danda 2004, 843). With increasing widespread deforestation driven by rising domestic and foreign demand the colonial authorities decided that the industry need to be regulated so in 1876 the sha was declared a reserved tree (Bryant 1997, 92-95). Even so the law was regularly flouted and by around 1870 most of the large cutch-producing trees had been eradicated from the forests of Tharrawaddy, Prome and Thayetmyo. Cutch traders began to switch their focus to Upper Burma, the complete decimation of the country's remaining sha forests only being halted due to competition from cheaper substitutes such as mangrove bark and aniline dyes. 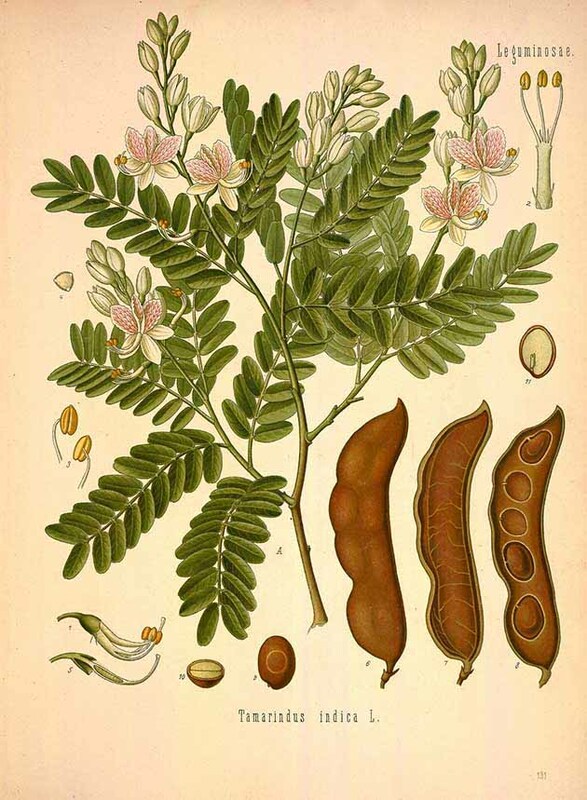 As a recently introduced species, Acacia catechu is unlikely to have been used as a traditional dye within Indonesia. Even so, in 1518 one of the first Portuguese to arrive in the East Indies recorded that cacho was being exported from Cambay to Malacca, probably as a dyestuff (Duarte Barbosa 2002, vol. 2 174). There are a few indications that it may have been used in various parts of the archipelago more recently, although it is not clear whether these relate to Acacia catechu, Areca catechu or Uncaria gambir (Bühler 1948, 2495). 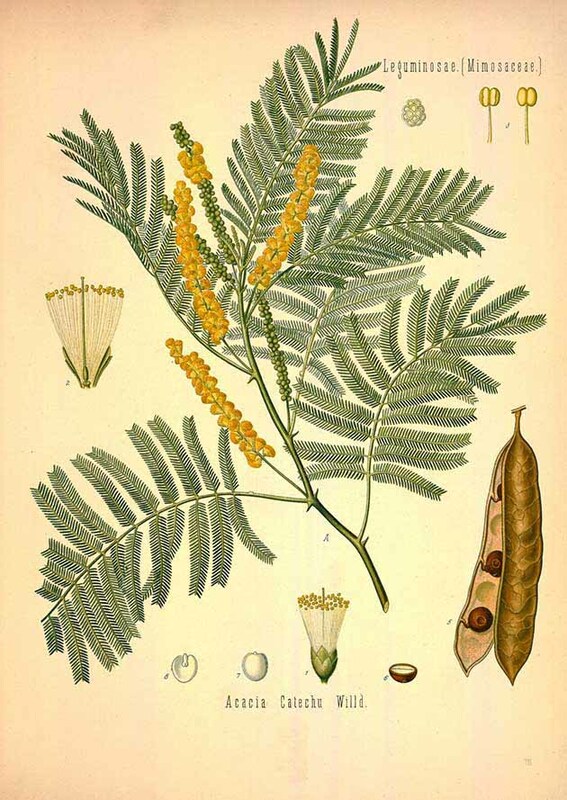 There is one report that akasia (Acacia catechu) is used as a brown dye in Indonesia today, probably on Java (Indrianingsih and Darsih 2013). The bark of Acacia nilotica has been traditionally used to produce gum Arabic. Although this is mainly used as a thickener and stabiliser in the food industry, it is also a fast dye on cotton. It is extracted from the dry powdered bark in alkaline solution and produces a range of shades from brown to grey, depending on the metal mordant used (Sengupta 2007, 256). Bengal catechu was not the same as Indian cutch or catechu, being obtained from the bark of the mangrove Ceriops candoleana (Tortora and Johnson 2013, 106). An inferior form of catechu was produced from Bombay catechu (Areca catechu). Gambier, also called white cutch and confusingly catechu, is obtained from the leaves and twigs of the vine Uncaria gambir (Gould 2012, 25; Adrosko 2012, 40). It grows in regions of high uniform rainfall such as West Sumatra, the lowlands of east coast Sumatra and the offshore islands such as Riau, the west coast of Kalimantan, and West Java (Achmadi and Choong 2012, 884). In 1832, Bintan Island in the Riau Archipelago had 6,000 gambier plantations producing 4,600 casks annually, which were exported to China, Japan and Java (Von Bibra and Ott 1995, 211). The former Dutch plantations had been taken over by Chinese operators using Chinese immigrant labour. In West Sumatra the plantations were mainly located in Limapuluh Kota and Pesisir Selatan. Gambier was also cultivated in Singapore. Gambier contains about 40% tannins, primarily catechin, catechu tannate and pyrocatechol (Fauza 2014). 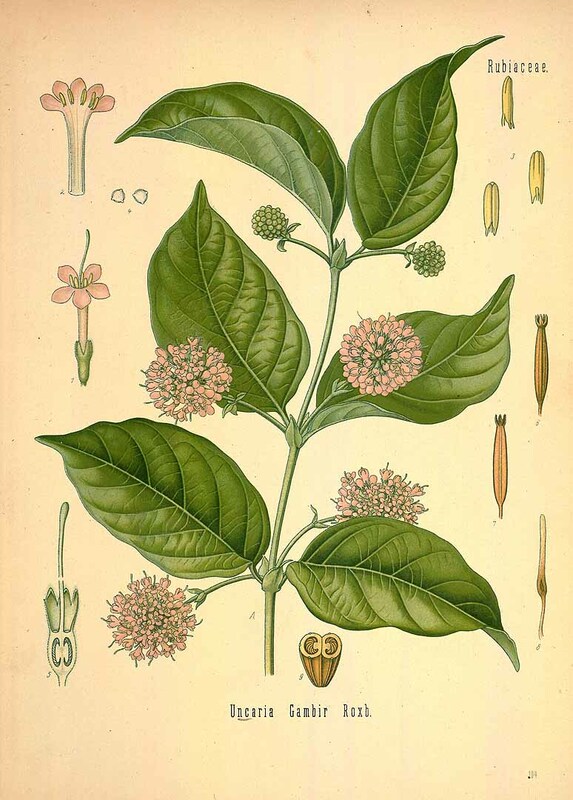 It was primarily used as a betel chew, especially on Java, as well as a medicine, tanning agent and dye. During the nineteenth century it was exported to the dyeing and tanning industries in Europe (Fauza 2014). In the decades before World War II, some 15,000 tons of Indonesian gambier were being exported, mainly to the UK and the USA. In Lyon, France, Indian gambier was used in the 1920s to dye silk (Paerels 1923). Locally it seems to have been used for dyeing fishing nets and as a textile dye, especially for silk. To make gambier, young leaves and twigs were bound and boiled in an iron vessel for an hour and then pressed and filtered. The liquor was allowed to stand to precipitate the gambier, which was then shaped into cubes or cakes and air-dried for about four days. Gambier extract is soluble in boiling water and is therefore easy to use as a dye. Under the British, colonial Sarawak appears to have been an important producer and exporter, with the first factory established in 1892 (Foreign Commerce Weekly, vols. 18-19, 1944, 5). In the past it was used as a brown dye in Malaysia (Keane 1896, 254), while on Borneo it was used as a brown dye for cotton by the Iban (Sutlive and Sutlive 2001, vol. 1, 495). A kain bidak from South Sumatra dyed with gambier. The Richardson Collection. 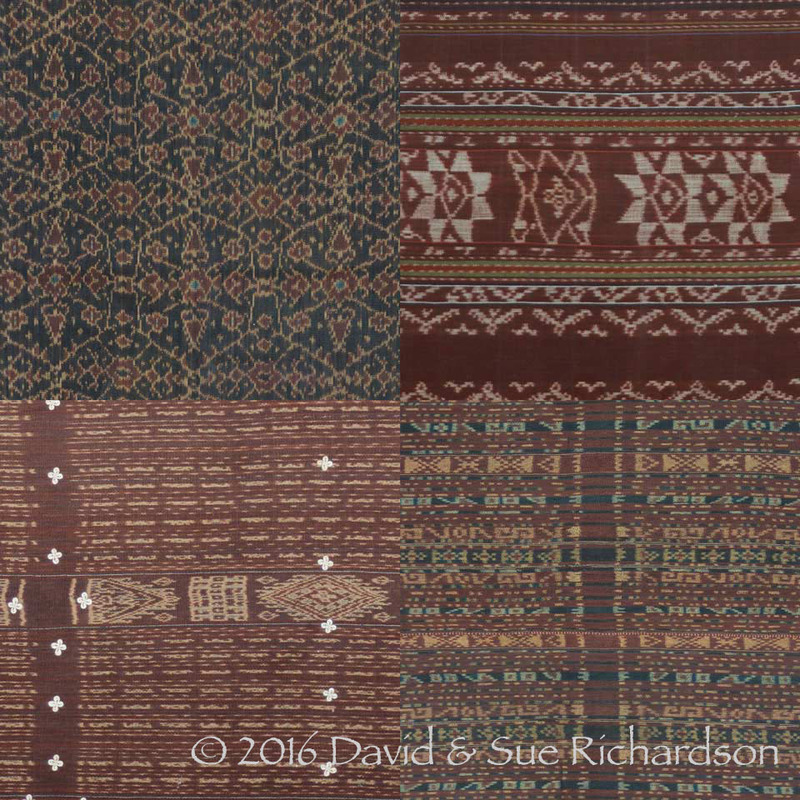 In South Sumatra, Komering and Pasemah dyers used gambier to obtain the rust brown background on their bidak shoulder cloths (Latief 2016, personal communication). On Java the leaves of gambier were added to yellow flame tree bark, soga jambal, to make soga brown batik dye in Samarang (Jasper and Pirngadie 1916, 43). Its use has also been recorded on Solor and Alor (Subagiyo 2007, 35). The colour of gambier can be mofified by the use of metal mordants. Chrome enhances its brown colour, iron salts give it a greenish tint, while salts of aluminum or tin make it yellower in colour (Paerels 1923). The tamarind (Tamarindus indica) is a large, long-lived, evergreen or semi-evergreen tree that can grow up to 30m in height (El-Siddig et al 2006). It produces long straight or curved light grey or brown seedpods, each containing up to a dozen black seeds. 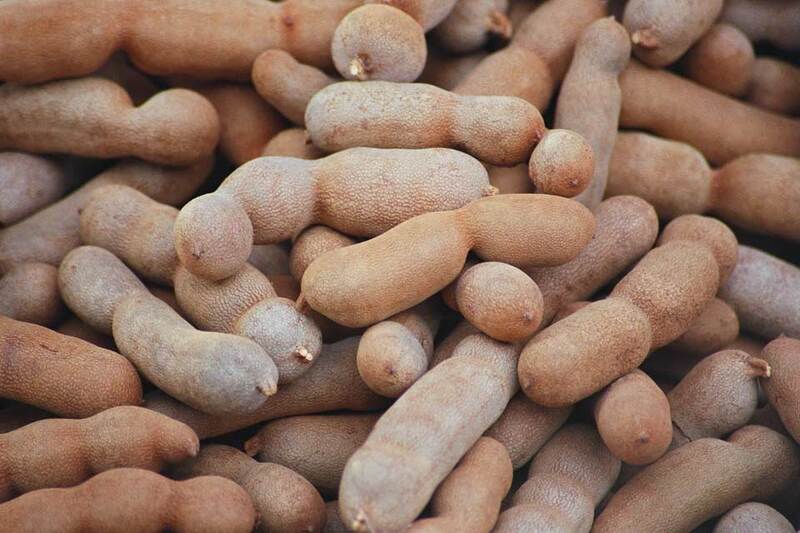 Tamarind is the only species in the genus Tamarindus, although it does have different sweet and sour varieties. Note however that the term tamarind is also applied to other unrelated plants such as the sweet tamarind (Inga spp.) (Janick and Pauli 208, 401). Although tamarind thrives in regions of high rainfall, its fruit development requires a long dry season. Tamarind probably originated in tropical Africa, and was introduced into Southeast Asia during the first millennium BC – possibly by Arabic traders (El-Siddig et al 2006, 12). It is now found across tropical Asia. Tamarind is called makham, bakham or somkham in Thailand, am pul, ampil or khoua me in Cambodia, and magyi, magyee or majee-pen in Burma. In Malaysia it is called asam jawa and in Indonesia asam jawa, assam or tambering (El-Siddig et al 2006, 3-4). Tamarind seedpods and their seeds contain around 20% tannin (El-Siddig et al 2006, 18). Tamarind dye is easily produced by boiling the seed pods in water. It colours cotton and silk in a range of shades ranging from soft light brown to reddish-brown and brown, depending on the mordant used (Tepparin, Sae-be, Suesat, Chumrum and Hongmeng 2012; Umar, Najib bn Muh’d nor and Wong 2013). For example on cotton, tamarind alone produces a bright reddish-brown (Tepparin et al 2012). With zinc it produces light reddish-brown, with chrome a yellow-brown and with iron a dull grey. Although the dye is relatively fast, it tends to change colour during washing. On the west coast of Sumatra an important brown dye was prepared by mixing sepang (sappan, Caesalpinia sappan), morinda and tamarind, especially in the Kauer region of southern Bengkulu Province (Totton 2009, 47). 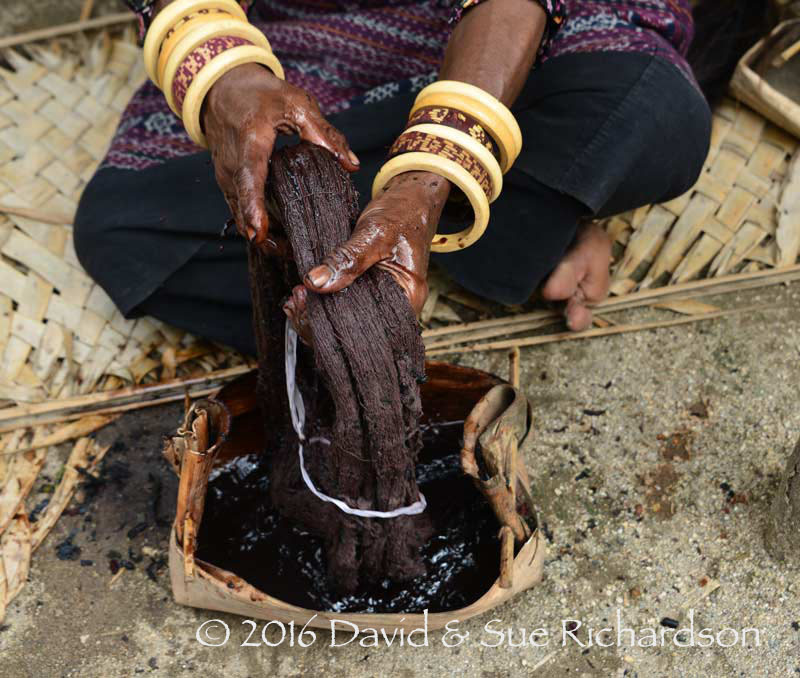 At Bungamuda on Ile Api, Lembata Island, dyers use tamarind in the belief that it strengthens their cotton threads and stops them breaking, although it must have a mordanting effect as well. 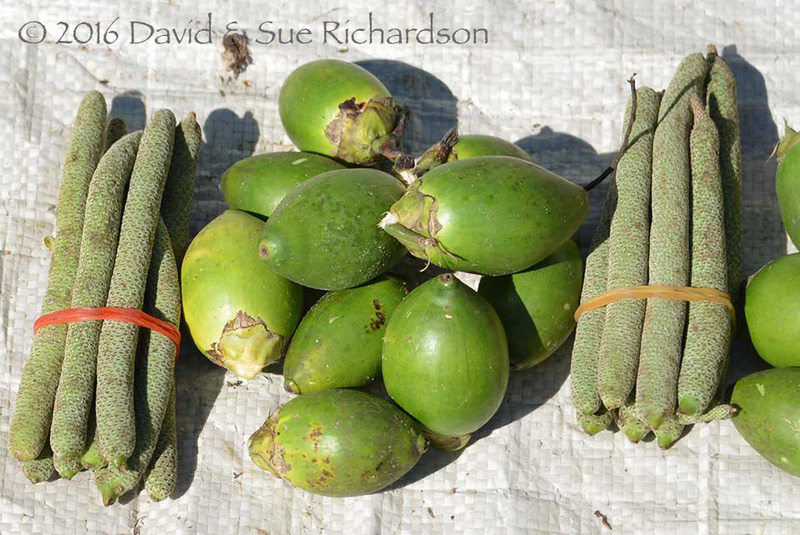 They mix tamarind seedpods with the fruit of the kepuk tree, the latter having first been roasted until it is scorched. The mixture is boiled and allowed to cool before the threads are immersed. Among the Amarasi on Timor, yarns were sometimes immersed for a week in a tamarind solution prior to dyeing (Saunders 1997, 66). Tamarind has also been used as a mordant, for example to fix cochineal in Malacca (Brunello 1973, 26). Tamarind is an effective mordant for both turmeric and pomegranate, enhancing colour strength as well as wash- and light-fastness (Prabu 2014). 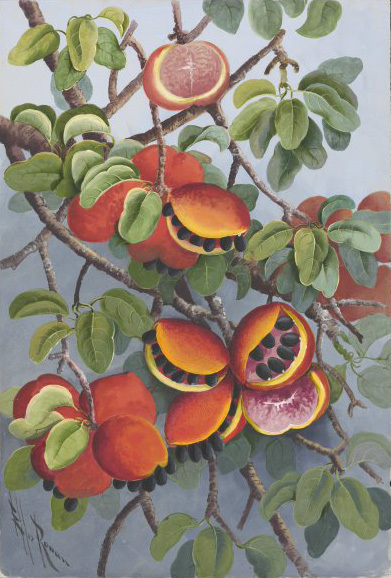 In India it was used as a fixative with dyes such as lac (Walker 1841, 393). Some dyers have used tamarind juice as a source of acid instead of citrus juice (Warming and Gaworski 1981, 71; Stuart-Fox 1993, 89). One important brown dye, previously used widely on Java, is obtained from the bark of the yellow flame tree, Peltophorum pterocarpum, also called the copperpod or yellow poinciana, a member of the Leguminosae family. Some writers such as Jasper and Pirngadie refer to it by the synonym Peltophorum ferrugineum. The yellow flame is a fast-growing deciduous tree that normally grows from 15 to 24m but can reach up to 50m (CABI Encyclopedia of Forest Trees 2013, 316). It has a straight trunk with a smooth grey bark and a dense umbrella-shaped crown. Its fragrant orange-yellow flowers are clustered on long racemes with a terminal panicle up to 45cm long. The fruit is a flat oblong, lance-shaped pod containing bean-like seeds. The yellow flame tree is a lowland species that rarely occurs over 100m in altitude. It prefers coastal locations, preferably along beaches and in mangrove forests, especially along their inner margin. On Java it is found in fields and teak forests. Yellow flame is distributed over a large area including Sri Lanka, the Andaman Islands, Burma, Thailand, Laos, Cambodia, Vietnam, Malaysia, Indonesia, the Philippines, and locally in Papua New Guinea and northern Australia. In recent decades the tree has become a threatened species in some areas. The bark contains from 11% to 21% tannin, mainly in the form of pigment-rich condensed tannins or proanthocyanidins (Lemmens and Soetjipto 1991, 101-104). 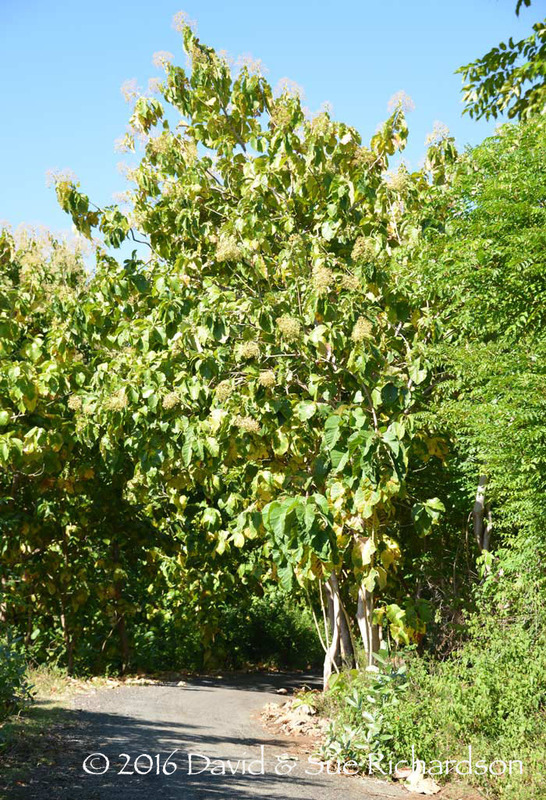 In Thailand a reddish-brown dye for silk was obtained from the closely related yellow batai tree (Peltophorum dasyrachis), known locally as the alang tree. The dyewood, called maj alang, was chipped and soaked in boiling water overnight before being boiled again the next day. The silk was only added when the temperature became hand-warm (Moeyes 1993, 148 and 154). It seems probable that P. pterocarpum is the dyestuff known locally as kroung or in Indonesian as kulit soga (soga bark) to produce a reddish-brown colour in the Sikka region of Flores (Lewis 2014, 411). It was probably used elsewhere in the Lesser Sunda Islands, but was never recorded. On Rote Island it was used by dyers to clarify their indigo dye baths and remove unwanted impurities (Ciba-Geigy Review vol. 8 1951, 3089). The important brown dyestuff known as soga was used extensively in the batik industry of Java. 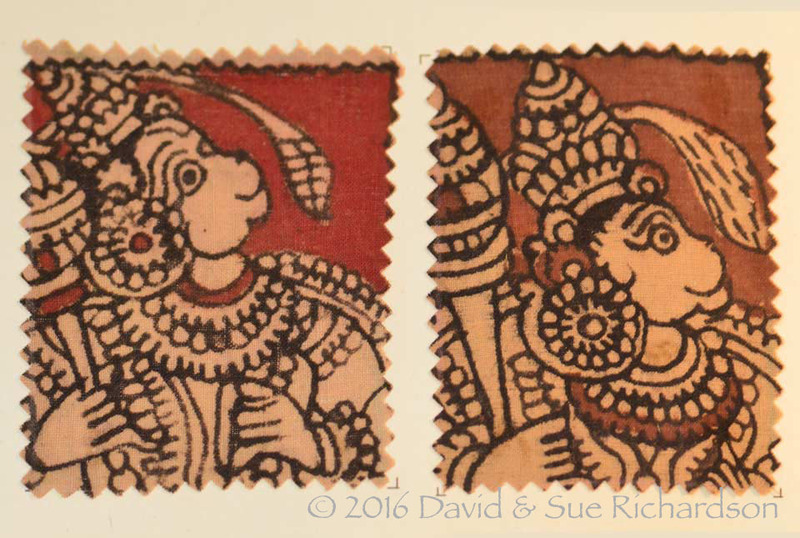 It was one of three main pigments used to dye batik on Java – the other two being indigo and morinda. Soga is actually a mixture of at least three dye barks: from the yellow flame tree, Indian mangrove and cockspur thorn – soga jambal (Peltophorum pterocarpum), soga tinggi (Ceriops candolleana), and soga tegeran (Cudriana javanensis) respectively. Soga dyeing was a speciality of Central Java, especially in the court cities of Yogyakarta and Surakarta (Wronska-Friend 2006, unnumbered pages). This may have been because on Java the yellow flame tree was almost exclusively confined to the coasts of Central and East Java, especially the southern coast of East Java (Jasper and Pirngadie 1916, 39). Because of this dried soga bark was available from every large market in Central and East Java. Batik dyed with soga is called kain soga. 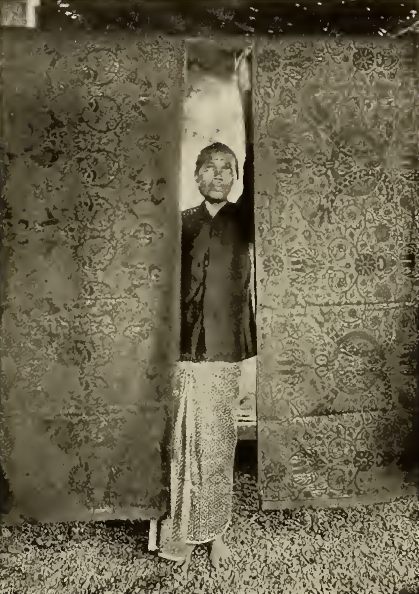 One special class of batik dyed with indigo, morinda and soga was developed by Chinese workshops on the north coast of Java at some time between 1890 and 1910. The process then spread eastwards towards Surabaya, and southwards towards the central highlands. The batiks were called tiga negeri (three regions) because they were made across three regions of central Java, each of which was a specialist centre for one of the three different natural dyes employed. Usually the red morinda was dyed in Lasem, the indigo in Pekalongan or alternatively Demak or Kudus, and the final soga brown added in Surakarta (Solo) or Yogyakarta. The traditional 'soga-batik' process was called nyoga or menyoga (meaning to paint with soga). 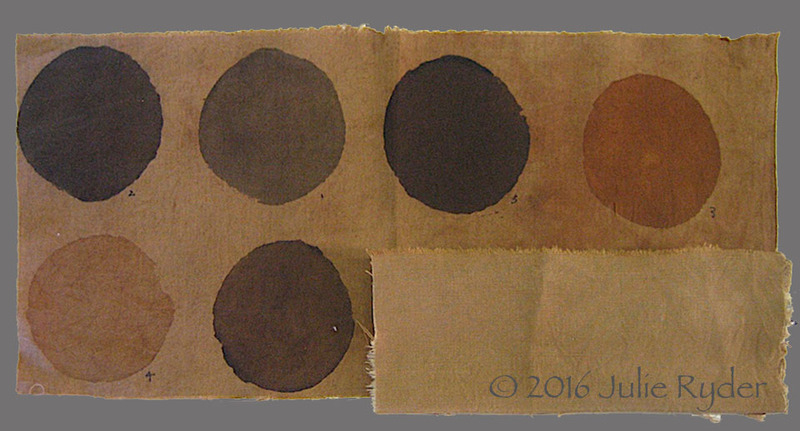 Each dyer had his or her own secret formula, meaning that each batik-producing area tended to have its own characteristic shade of soga brown. Typically the barks were chopped into small pieces (3cm to 5cm) and mixed in the ratio: 4 parts yellow flame tree, 2 parts mangrove and 1 part cockspur thorn. These proportions could vary depending on the desired shade (Lemmens and Soetjipto 1991, 90 and 101-104). Sometimes the heartwood of sappan (Caesalpinia sappan) or the bark of soga tekik (Albizia lebbekoides) was also added to give a more reddish colour, and pine resin was often added as well. The barks were covered with water and boiled until the amount of water had roughly halved and the mixture had thickened to the right consistency - this usually took about 8 hours. After cooling, filtering, and about two hours of precipitation, the liquor was transferred to the dye bath. The waxed batik was then immersed in the cooled dye for around 15 minutes and was then turned over and over to allow the dye to evenly penetrate. The dyed cloth was initially hung from a rack over the bath, and after it had stopped dripping it was taken and dried in the shade. This process of soaking and drying was repeated over and over again for a period of several weeks. Usually 16 to 18 immersions were sufficient, but for a fine quality kain soga 30 immersions might be necessary to achieve a deep and even colour (Lemmens and Soetjipto 1991, 90 and 101-104). The components of soga are partially substantive dyes that do not require a mordant. However a metal mordant can improve binding and enhance the colour. After dyeing, soga was usually fixed in a bath of lime and alum known as saren (Sheares 2009, 118). Some fixatives were more complex and included lime, sugar, and traditionally alum and the flower buds of the pagoda tree (Sophoria japonica) or borax, palm molasses, alum, annatto, and lemon juice (Jansen and Cardon 2005, 56). This final fixing made the colours faster and brighter. After completing the dyeing process, the wax was boiled away and the batik, dried, folded and pounded with a wooden mallet. Depending on how it is formulated, soga produces a range of colours from warm yellow to rich brown. However soga is not as light- or wash-fast as indigo or morinda (Haake and Winotosastro 1993, 451). It has been claimed that during the multiple dyeing stages of batik, natural soga penetrates the wax, tinting the underlying white cotton (Haake and Winotosastro 1993, 451). This provides a method of separating naturally from synthetically dyed batiks. Soga dye was also used as an over-dye on textiles already dyed with indigo, to obtain shades of purple and black. The small tropical tree, Baccaurea racemosa, grows from sea-level up to 1,600m in primary and secondary rainforests, riverine forests and freshwater swamp forests (Haegens 2000; Lim 2012, 244). It is evergreen and has a dense canopy, growing up to 15-20m in height. It is found in Thailand, Malaysia and Indonesia. In Indonesia and Malaysia, including Sumatra, Java and Bali, it is generally known as kapundung (Quattrocchi 2012, 506). However some authors refer to kepundung. It also has many local names such as jinteh merah in Malaysia, ninggih in Batak Sumatra, kisip in Bengkulu Sumatra, rambai and tampui in Lampung Sumatra, kapundueng in Minangkabau Sumatra, and tangkilang in Bali (Lim 2012, 243). In Tenganan, Bali, the tree and its bark is called kihip and on Nusa Penida Island babakan pandung. The edible fruit is called menteng. The barks of Baccaurea racemosa and related species such as B. javanica and B. ramiflora can be used to make both a tannin-rich dye and a mordant (Jensen 1999, 77; Lim 2012, 247 and 250). It is possible that the leaves can also be used as a dye. Unfortunately information on its use as a dye is sparse – indications are that the bark of B. javanica dyed cotton and linen a yellowish-red or violet colour (Lemmens and Soetjipto 1991, 16). Apparently the bark of several species of Baccaurea were used as one of the ingredients in the dye process, known as pekan in Malay, used to colour silk yellow, red or mauve (Verheij and Coronel 1991, 99). This was probably developed in the traditional silk-weaving centre of Pekan, in Pahang State, Malaysia. On Java batik makers sometimes enhanced the strength of their scarlet-red morinda (wúng kudu) by the addition of ‘kepundung’ bark, which Raffles described as jirak, a common name applied to dye barks (Raffles 1830, 190). The bark was also added to the morinda dye bath in both Tenganan Pegrinsingan on Bali and on offshore Nusa Penida (Nabholz-Kartashoff 1991, 128; Hauser-Schäublin 1997, 99). In Tenganan the kihip bark was pounded with morinda root. On Nusa Penida Island, Max Weber recorded a recipe in 1972 from a village close to Klumpu, in the island's centre. Powdered morinda (known locally as sunti) babakan pandung bark, candlenut oil and fish powder were added to water and filtered (Nabholz-Kartashoff 1991, 128). The yarn was then immersed in the bath and kneaded and turned. The process was repeated daily over ten days, a fresh bath being prepared every day. The tannin-rich fruits, leaves and bark of myrobalan have been widely used as both a mordant and a yellow, brown and black dye for both cotton and silk. The term myrobalan is applied to trees belonging to the genus Terminalia, a family of about 200 tall tropical deciduous trees producing small globular fleshy fruits, ranging in size from hazelnut to walnut and in colour from yellow to black. The most well-known are the Indian myrobalan (T. arjuana), black or chebulic myrobalan (T. chebula), belleric myrobalan or beach almond (T. bellerica), yellow or citrine myrobalan (T. citrina) and the Indian almond (T. catappa), sometimes called the Java or sea almond. Black myrobalan is found from Nepal and north India to Sri Lanka, Burma, Thailand, Cambodia, Vietnam and southern China (Jansen and Cardon 161). Belleric mylobalan is found across large parts of Southeast Asia and Indonesia (Lemmens and Soetjipto 120). 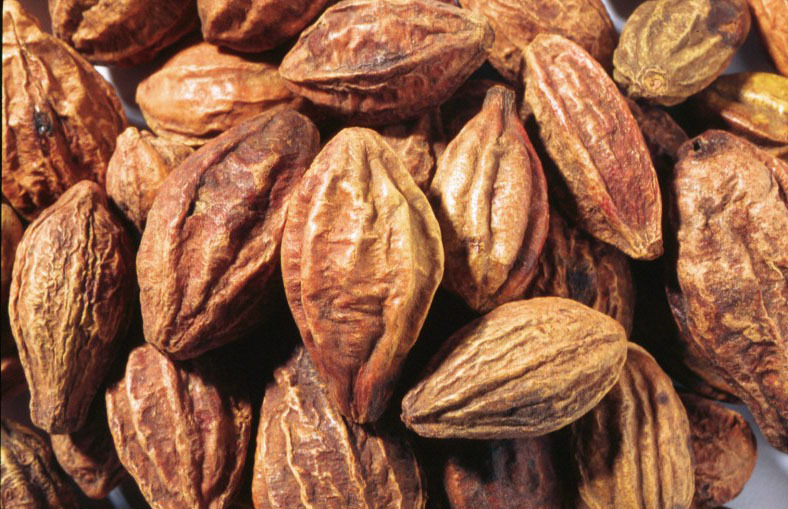 The Indian almond or sea almond (T. catappa) grows throughout Indonesia at altitudes below 800m, especially on or near the coast (Thomson and Evans 2006). A wide variety of vernacular names have been recorded for the various species of myrobalan, such as pangah, penga and mana in Burma, maa-nae, maak-nae and samo thai in Thailand, srama in Cambodia, ketapang, lingkak and manja in Malaysia and ketapang in Indonesia (Quattrocchi 2012, 3695-3697). The Indian almond has many local names in Indonesia, such as katapieng in Minangkabau, talisei and salarisé in North Sulawesi, ketapas on Timor, lisa on Rote and tilliso, tilliho and ngusu in North Maluku (Heyne 1987, vol. 3, 1502-1503). In India, the dried fruits of black myrobalan were used extensively as a mordant for dyeing calico. The best myrobalan was said to come from Madras. Myrobalan became popular because it was cheaper than gallnuts, and stronger than sumac (Watt 1893, vol. 6, part 4, 29). With an aluminium mordant it produced yellow and with an iron mordant, black. Myrobalan was the crucial mordant used in the production of printed kalamkari calicos at Machilipatnam, just north of Chennai, on the Coromandel Coast. These were originally decorated using a pen-like brush and later using carved wooden printing blocks. The bleached and starched calicos were first treated with a solution of myrobalan and buffalo milk, the latter helping to brighten the printed colour and preventing it spreading from one side to the other (Mohanty, Chandramouli and Naik 1983, 102-104). The cloth was then block-printed with iron acetate to produce the black pattern, and then with alizarin and alum to produce red. For chocolate brown they simply mixed alum and iron acetate. In the past many calicos from this region were exported to Indonesia. Myrobalan seems to have been used extensively in Thailand for producing a range of shades from yellow through brown to black. According to Moeyes, who calls the tree sa mor, the dried fruits dye cotton and silk a tan colour while the hardwood, maj sa mor, dyes them a reddish brown (Moeyes 1993, 148-149 and 155). The hard dried fruits are ground in a mortar and soaked overnight before being boiled for one to two hours. The cotton or silk is added when the bath becomes hand-warm. For cotton, but not silk, the bath is brought back to the boil for one hour. 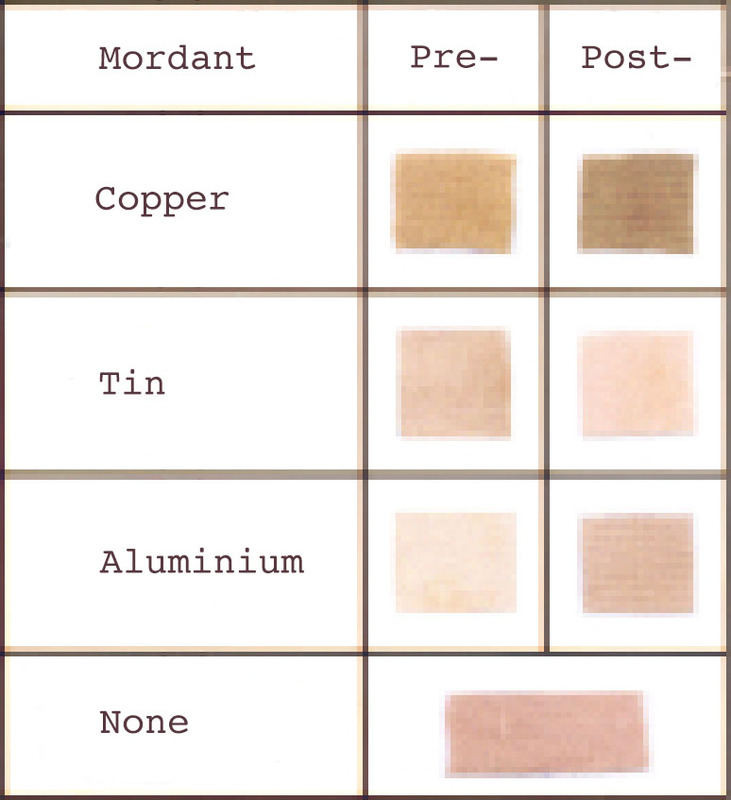 The chipped dyewood is treated in exactly the same way. The more dyestuff used, the deeper the shade. Cotton dyed with myrobalan can be post-mordanted with metal salts other than tin, while silk dyed with myrobalan can be mordanted with a lime paste of soda ash. Myrobalan was one of the dyes used in Northeast Thailand listed by Kikuo Morimoto in 1990 (Gittinger and Lefferts 1992, 247). The fruit and bark were used to produce a yellow to gold dye with alum, and a black dye with iron. Apparently Henry Burkhill identified it as a brown dye in his 1935 tome on the economic products of the Malay Peninsula (Gittinger and Lefferts 1992, 243). 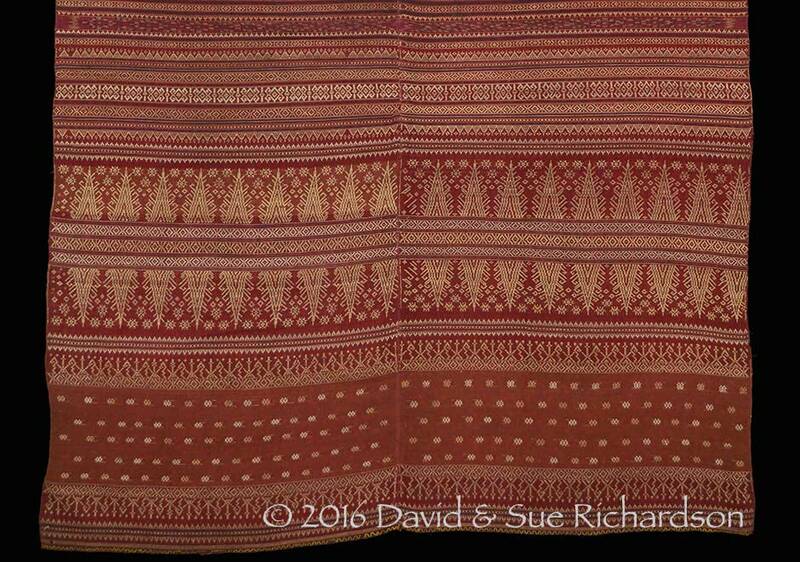 We know that the fruits of sa mor were used as a dye in the important silk-weaving village of Ban Tasawan in Surin Province. There are just a few scanty references to the use of myrobalan as a dye in various parts of Malaysia and Indonesia, such as Sarawak and Kalimantan (Kessler 2000, 46). The leaves of ketapang are still used in Jon village, Bonjonegoro, East Java, to dye batik (Fauziyah and Hakim 2015). Ketapang leaves were mixed with the wood of cockspur thorn, kayu kuning, to produce a yellow colour in the Leti Islands (Jasper and Pirngadie 1912, 72). They were mixed with turmeric and the leaves of Urena lobata to produce green on Selayar Island just south of Halmahera in Maluku (Jasper and Pirngadie 1912, 71). It would be amazing if such readily available dye sources had not been used more widely throughout the Malay Archipelago in the past. The highly valued teak tree (Tectona grandis) grows up to 45m tall. 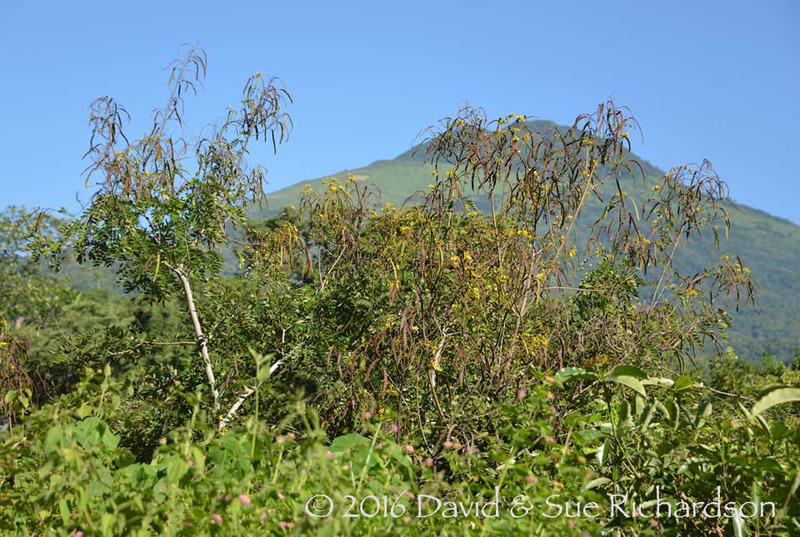 It is deciduous, shedding its leaves in the dry season (Praciak 2013, 460). Teak grows from India through Southeast Asia and is thought to have been introduced into Java from India and Burma many centuries ago (Whitten et al 1988; Soerianegara and Lemmens 1993; Pyne 1997, 421). It now grows in the mountains of Sumatra, in south Sulawesi and in Eastern Indonesia on Bali, Sumbawa, Flores and Timor – indeed Sumbawa seems to have been an important early producer and remains so today (Raffles vol. 1 1817, 38). Teak thrives on those islands that have a long dry season and has been more recently introduced to Sumba and Savu. Today teak plantations extend over one million hectares on Java, mainly in Central and East Java. Teak is known in Burma as kyun and to a lesser extent jati tek, and in Thailand and Laos as sak, mai sak or bai sak. In Malaysia and Indonesia it is generally called jati, although on Java some use the names deleg and kulidawa. The dye is extracted by heating the chopped leaves in water, preferably with the addition of a small amount of sodium carbonate (Tewari 1992, 196). Several reports indicate that the leaves should be fresh and young. Teak leaves contain 6% tannin and a mixture of quinonoid pigments. The main pigment is the dark red anthroquinone, tectoleafquinone (Saakshy, Sharmer and Jain 2013, 283). Teak leaves produce a range of colours on cotton, depending on whether or not a mordant is applied. Different sources report widely differing results. According to Dina Tawari, the hot dye mix produces an olive-brown or medium grey on cotton, and a 'caledonian-brown' on silk and wool (Tawari 1992, 196). The addition of sodium carbonate produces lilac on silk and wool, an iron or copper mordant produces slate grey, while chrome or tin result in a flesh-colour. A more recent study found that different metal mordants produced a range of paler shades from pink to light brown, with pre-mordanting resulting in different colours to post-mordanting (Bhuyan, Saikia and Das 2004). The latter authors rated the light-fastness and wash-fastness of teak leaves as poor to fair. However a second Indian study reported different findings. Teak leaves produced a greyish ruby colour on cotton, with moderate fastness to light and very good fastness to washing (Saxena, Vardarajan and Shaikh 2005). In Burma teak leaves were reported to produce a promising dark purple-brown dye (Marshall 1860, 247). In the Tharrawaddy district of central Burma they were used to produce a red dye that was not permanent (Hardiman 1900, 382). Teak leaves may have also been used by the local Karen tribe (Green 2008, 48). Young teak leaves have been used as a reddish-coloured dye in Laos, as well as for dyeing monks' robes a deep purplish-red (Cheesman 2004, 238). Dyers at Ban Phieng Ngam in the Luang Namtha region have recently beeen reported to be using teak leaves to produce a deep beige (Madigan 2015). Meanwhile dyers at the Ock Pop Tok workshop in Luang Prabang boil them to make pink. Teak leaves have also been used in Thailand and Cambodia. In Indonesia teak leaves have been reportedly used to produce a reddish-brown dye (Widiawati 2009, 120). Specific regional reports are hard to find. Teak leaves have certainly been used as a minor dye in the batik industry on Java - one workshop in Imogiri, Yogyakarta, still uses them to make a brownish-red. Teak leaves were also used on Sumbawa and Sulawesi to produce a light, reddish-brown dye (Hitchcock 1985, 35). In the 'Iwang Geté highlands of Sikka on Flores, dyers at Doka village prepare an attractive tan-brown dye by boiling teak leaves with turmeric root, kepang (Aquilaria malaccensis) and powdered lime. The yarns are normally dyed five or six times in order to obtain a deeper brown. Kepang (Aquilaria malaccensis) is a medium sized tree that grows in the tropics up to 20 metres in height. Wood infested with fungi becomes fragrant and is called agar and used as a fragrance. The Indonesian bay (Syzygium polyanthum, formerly known as Eugenia polyantha) is a tall deciduous tree that grows up to 30m tall. It is widely distributed in Burma, Indo-China, Thailand, Malaysia, and Indonesia, including Java, Sumatra and Kalimantan. Locally it is known as salam in Indonesia but also ubar serai on Sumatra and manting on Java (Sardjono 1999, 218-219). In Malaysia it is called samak, kelat samak and serah; in Cambodia pring srâtoab; and in Thailand daengkluai (central), dokmaeo (peninsular) and mak (Chumphon, Ranong). Both the bark and the leaves have been used to produce a reddish-brown dye. The leaves have been found to be rich in flavonoids, tannins and phenolic hydroquinones (Sulistiyani, Falah, Wahyuni, Sugahara, Tachibana and Syaefudin 2014). They are widely used throughout Indonesia as a flavouring. In Kayah State in Burma, next to the border with Thailand, it is thought to be the tree known as dta-pwin-maw. 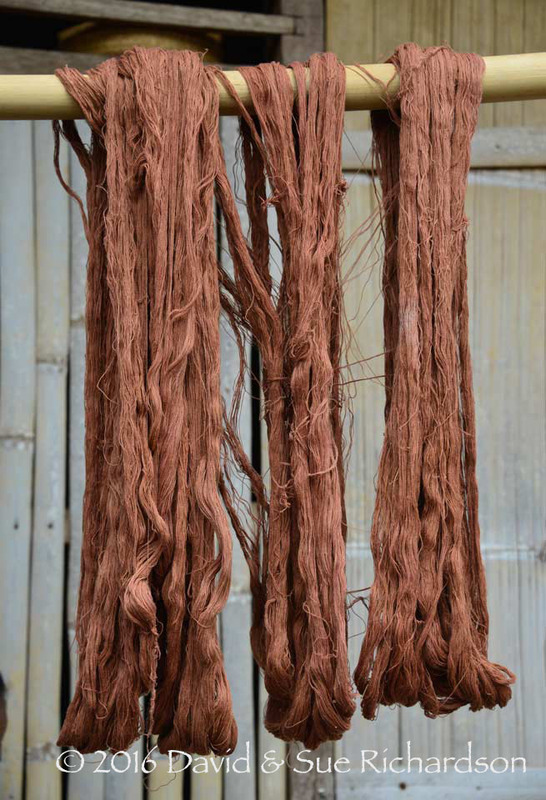 Its bark was used by the Red Karen to make a brownish red dye for use in women’s skirts (Dudley 2015, 122). In both Thailand and Indonesia the bark was pounded in water to yield a brownish-red dye that was used for tanning and strengthening fishing nets as well as for dyeing bamboo baskets and matting (Sardjono 1999, 218-219; Weiss 2002, 122; Suksri, Premcharoen, Thawatphan and Sangthongprow 2005). 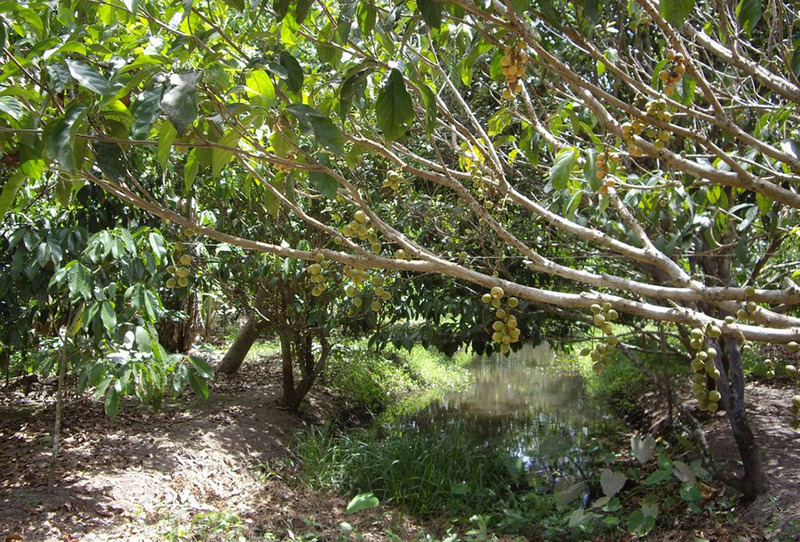 In Lampung, Sumatra, the leaves of the salam tree were used to produce a dark brown (Totton 2009, 42). Faloak (Sterculia quadrifida), known in as the peanut tree, is a small deciduous tree that reaches a height of over 15m. It grows on semi-arid land, including rocky plateaus, up to an altitude of 900m (Siswadi et al 2013). It is found in Indonesia on Timor Island and in Papua but also in PNG and Australia. However its distribution in other parts of Indonesia remains unclear. 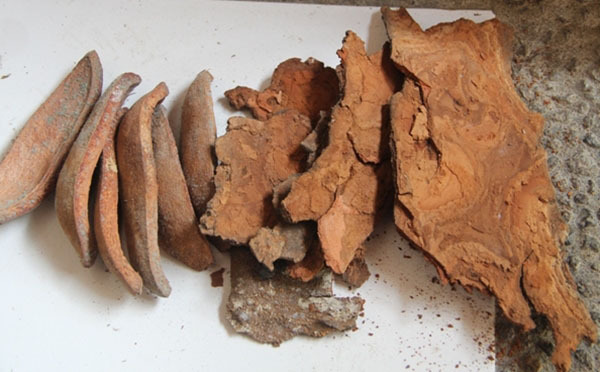 In Teunbaun, commonly known as Baun, Amarasi dyers pound and boil the inner bark of the faloak tree to produce a brown dye, the colour of which is enhanced with loba. Faloak bark has been found to contain alkaloids, flavonoids, saponins, tannin phenolics and terpenoids (Siswadi, Hadi, Saragih, and Rianawati 2013; Faridah and Hertiani 2015). It is widely used on Timor for its medicinal properties. In Australia, the inner bark is used by some Aboriginals as a baste fibre for making traditional baskets, string, rope, fishing nets and fishing line. 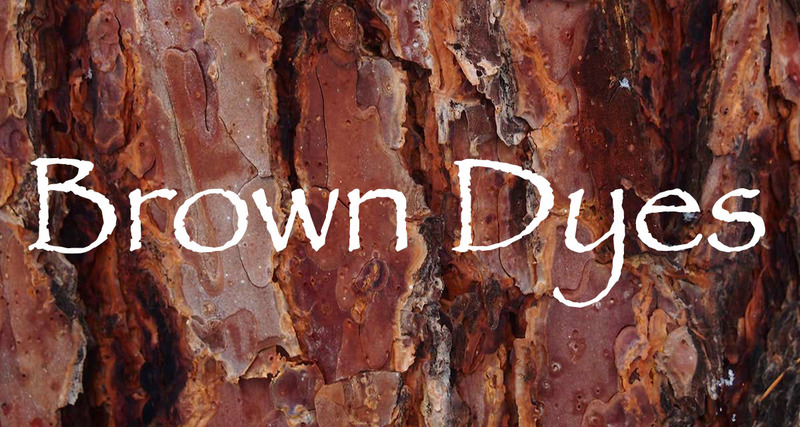 As mentioned at the beginning of this page, it is likely that brown dyes have been extracted from a huge range of tree barks and other plant stuffs in the past. Here we list a few additional brown dyestuffs that are used in Indonesia, either today or in the past. On Bali a brown dye was extracted from the fronds of the large perennial bracken Pteridium aquilinun (Heim 2015, 26). At Doka in the ‘Iwang Geté region of Sikka, Flores, they make an attractive brown dye from kunyit (turmeric), bei and kapang, all of which grow locally. On Tanimbar they produced brown from an undefined dyewood known on Selaru as kayu tongwe (Van Vuuren 2001, 40). In some regions the bark of candlenut was used for tanning and dyeing. Vegetable tannins are substantive dyes that bind well with cellulose and protein based animal fibres. They also chelate with metallic ions such as aluminium, iron and copper. 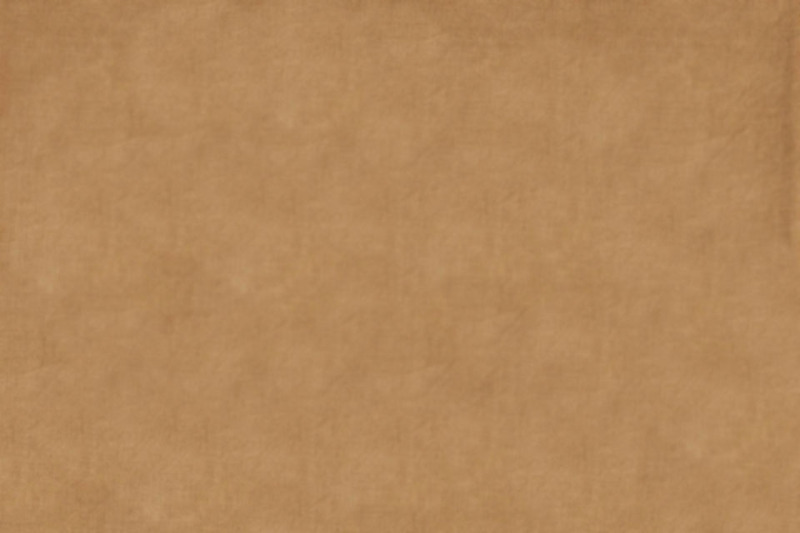 Although there has been much research into the tanning of leather, the chemistry of dyeing with tannins does not seem to have been addressed as a subject in its own right. It is not an easy matter to research, probably because a great deal of complex chemistry is involved. While we are unable to explain the full process, we have tried to understand what tannins are, and why they play such an important role in dyeing cotton, silk and wool. Vegetable tannins are a complex mixture of polyphenols – organic chemicals containing multiple phenol units (a phenol is an aromatic benzene ring bearing one or more hydroxyl groups). They are sometimes called plant polyphenols. Many are polymers with various degrees of polymerisation. Each plant species contains its own unique cocktail of tannins. These are easily extracted by boiling. However prolonged boiling adds an excessive amount of non-tannins (Dreaper 1912, 2). Tannins are powerful reducing agents and show a strong tendency to absorb oxygen, especially in alkaline solution. Their oxidation products are strongly coloured (Dreaper 1912, 1-2). Tannins can be divided into two types: hydrolysable tannins and condensed tannins. Hydrolysable tannins are derivatives of gallic acid and have a polyhydric alcohol such as glucose at their core. They are divided into two classes, gallotannins and ellagitannins, depending on which polyphenolic acids are produced on hydrolysis. Gallotannins tend to be colourless, while ellagitannins tend to be yellow (Garcia undated). Gallotannic acid has a similar structure to pentagalloyl glucose, with each of its five gallic acid molecules linked in tandem to a second gallic acid molecule. So-called tannic acid is a cocktail of gallotannins. The oxidative coupling of galloyl groups converts gallotannins into ellagitannins. Unlike condensed tannins, hydrolysable tannins are relatively stable to air and can be kept for several years (Okuda 1999). As their name suggests, hydrolysable tannins are easily hydrolysed by acids, bases or hydrolytic enzymes into sugars and their related polyphenolic acids. Some report that they are hydrolysed into gallotannic acid or elligitannic acid (Tang, Hancock and Covington 1992, 223). Others report that they are hydrolysed into gallic acid and ellagic acid (Kokate, Purohit and Gokhale 2009). Gallotannic acid and elligitannic acid tend to be yellow-brown in colour. Gallic acid is white or yellowish, and ellagic acid is cream to light yellow. Hydrolysable tannins are unstable in alkaline conditions and exhibit browning and degradation (Hemingway and Hillis 1971). Hydrolysis is slow in mild alkaline conditions, but accelerates with increasing alkalinity - especially above pH 11 (Tuominen and Sundman 2013). The main hydrolysis product is ellagic acid. Partial hydrolysis also takes place when hydrolysable tannins are boiled in water (Tuominen and Sundman 2013). 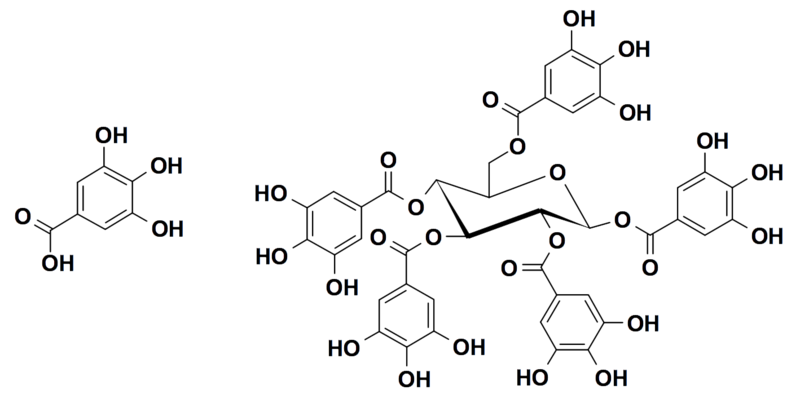 Both gallotannins and ellagitannins bind directly to cellulose, the strength of binding increasing with increasing molecular size, the number of galloyl groups they contain, and their hydrophobicity (Tang, Covington and Hancock 2003). However elligitannins are less reactive than gallotannins of the same molecular size. Hydrolysable tannins contain multiple galloyl units, each bearing three hydroxyl groups, so it might be thought that hydrogen bonding plays an important role in this cellulose binding process. While this may be a partial factor it seems that hydrophobic bonding is far more dominant, especially with the larger tannins. Hydrophobic bonding is stronger than hydrogen bonding, but its chemistry is not yet fully understood. This strong bonding explains why hydrolysable tannins play an important role in mordanting cotton. Hydrolysable tannins are found in myrobalan and sumac, which contain both gallotannic acid and ellagitannic acid, and in oak gallnuts, which contain over 60% tannic acid (Patel 2011, 413-414). The rind of pomegranate (Punica granatum) is rich in ellagitannins (Adams 2006). Interestingly, myrobalan, sumac and gallnuts were all used as mordants by dye workshops in Europe, the Middle East and India. Sumac and gallnuts were both used in the mordanting (‘sumaching’ or ‘galling’) stage for producing Turkey Red, while myrobalan was mixed with buffalo milk to pre-mordant calico cloth in the production of kalamkari in India. Condensed tannins were formally known as catechol tannins but are now awkwardly described as proanthocyanidins. 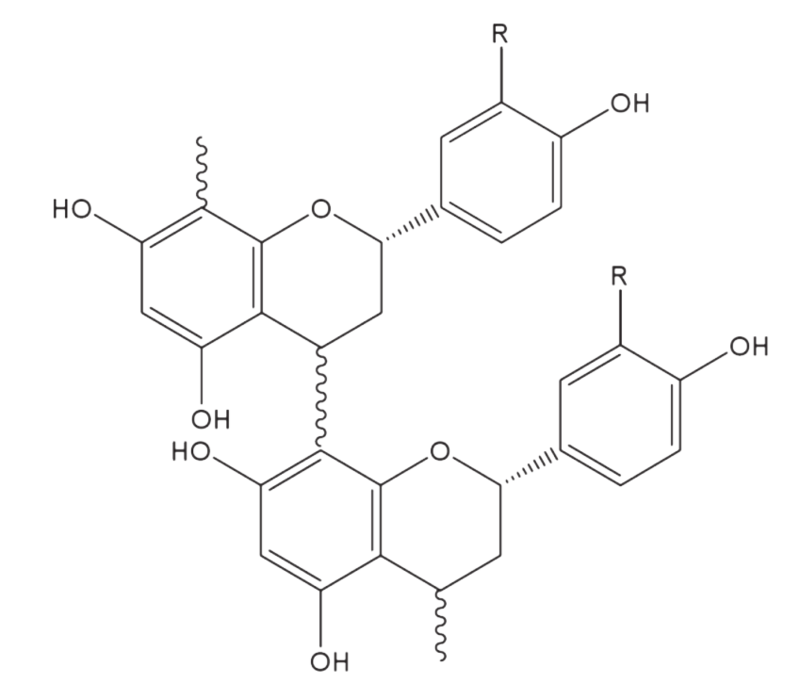 They contain from two, to over fifty flavonoid units and many have complex polymer structures (Sakai 2000, 256). Most commonly, however, they contain from 4 to 12 flavonoid units (Viera, Lelis, da Silva and Oliveira 2011). Many proanthocyanidins are responsible for the colours of flowers, fruits, and vegetables (Haslam 1989). They tend to be reddish-brown. A multitude of proanthocyanidins, along with the two flavon-3-ols catechin and epicatechin, have been found to be commonly present in most tree barks (Sakai 2000, 255-256). It has been found that the extraction of proanthocyanidins from tree barks is sometimes, but not always, increased by heating (Scalbert 1992, 272). Heating improved the extraction of proanthocyanidins from pomegranate peel, but above 50°C yields slightly declined - possibly because of partial degradation (Wissam, Ghada, Wassim and Waris 2012). Rapid degradation occurs when extraction times exceed 30 minutes. Water turns out to be one of the best extraction mediums. 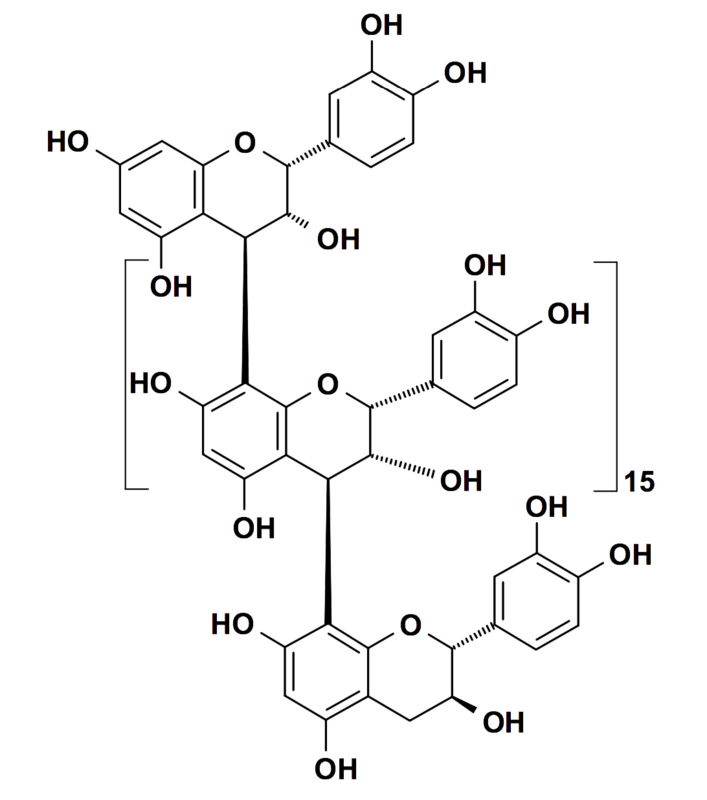 Structurally it is thought that proanthocyanidins that are polymers of catechin form right-handed helixes, while those that are polymers of epicatechin form left-handed helixes (Haslam 1977). Unlike hydrolysable tannins, condensed tannins contain strong inter-flavonoid bonds and are not easily hydrolysed (Bisanda 2003). When treated with an acid or other hydrolysing agent their colour changes from yellowish to reddish-brown. Again the chemistry is complicated. In mild acidic aqueous solution, proanthocyanidins are readily catalysed into the component flavan-3-ol and an intermediate quinone methide (Porter 1992, 250). The latter is highly reactive and is quickly oxidised in air to a red anthocyanin (Scalbert 1992, 268). At the same time there is an important side reaction with some of the proanthocyanidin being polymerised into phlobaphens (Patel 2011, 414). Proanthocyanidins are stable in alkaline pH (Wissam, Ghada, Wassim and Waris 2012). An important property of proanthocyanidins is their ability to strongly complex with carbohydrates, polysaccharides such as cellulose, and proteins (Porter 1992, 250; Rohr, Meier and Sticher 2000, 500). This binding is powerful and hard to reverse. It is possible that a stronger process than hydrogen bonding is involved, such as hydrophobic bonding. Some have even suggested that the bonding might be the result of covalent (chemical) bonding (Ebrahimnejad, Burkholz and Jacob 2014, 216). Phlobaphenes likewise bind with proteins and can be used to precipitate them (Hopkins 2014 unnumbered). We suspect that, just like their proanthocyanidin precursors, they also bind strongly to cellulose which is why they are such valuable pigments. A second important property of proanthocyanidins is that they form strong complexes with aluminium Al(III) and ferric iron Fe(III), that are often insoluble (Porter 1992, 249). However they do not complex strongly to ferrous iron Fe(II), zinc Zn(II), or copper Cu(II) (Ebrahimnejad, Burkholz and Jacob 2014, 220). Proanthocyanidins make more interesting dyes than hydrolysable tannins, giving stronger red and brown shades due to their oxidation into phlobaphens (Cardon 1998, 73). Examples of proanthocyanidin-rich dyestuffs include mangrove bark, areca nut, cutch or catechu, gambier and yellow flame tree bark. Many of these are prepared in mild alkaline solution, possibly to minimise the decomposition of the proanthocyanidins before they bind with the textile fibres. Achmadi, Suminar S., and Choong, Elvin. T., 1992. Utilization of Tannins in Indonesia, in Plant Polyphenols: Synthesis, Properties, Significance, Hemingway and Laks (eds), pp. 881- 894, New York. Cardon, Dominique, 1998. Polyphenols and natural dyes: a historian comtemplates chemistry, in Polyphenols 96: 18th International Conference on Polyphenols, pp. 45-79, Paris. Dreaper, W. P., 1912. Tannins, in Tannins, Dyes, Colouring Matters and Inks. El-Siddig, Gunasena, Prasad, Pushpakumara, Ramana, Vijayanand, and Williams, 2006. Tamarind: Tamarindus indica, Southampton. Fauza, Hamda, 2014. Gambier: Indonesia Leading Commodities in The Past, International Journal on Advance Science, Engineering and Information Technology, vol. 4, no. 6, pp. 67-72. Garcia, Michel, undated. Dyeing with Tannin from Plants, Used as Mordant Dyes, pp. 351-352. Hemingway, Richard W., and Laks, Peter E., (eds), 1992. Plant Polyphenols: Synthesis, Properties, Significance, Plenum Press, New York. Indrianingsih, Anastasia; and Darsih, Cici, 2013. Natural Dyes from Plants Extract and Its Applications in Indonesian Textile Small Medium Scale Enterprise, Eksergi, vol. 11, no. 1, pp. 16-22. Janick, Jules; and Paull, Robert E., 2008. The Encyclopedia of Fruit and Nuts, CABI. Julkunen-Tiitto, Riitta, and Häggman, Hely, 2009. Tannins and Tanning Agents, in Handbook of Natural Colorants, Bechtold, Thomas, and Russak, Rita (eds), Chichester. Mahale, Geeta; Sunanda, R. K., 2008. Dyeing of cotton with arecanut extract - An eco friendly approach, Colourage, vol. 55, issue 1, p. 84. Paerels, J. J., 1923. De Cultuur van Gambir in den Indischen Archipel, Nederlandsch-Indie Oud & Nieuw, vol. 8, issue 1, pp. 15-24. Prabhu, K. H., 2014. Eco-dyeing using Tamarindus indica L. seed coat tannin as a natural mordant for textiles with antibacterial activity, Journal of Saudi Chemical Society, vol. 18, issue 6, pp. 864-872. Raghavan, V.; and Baruah, H. K., 1958. Arecanut: India's popular masticatory: history, chemistry and utilization, Economic Botany, vol. 12, pp. 315-345. Sakai, Kokki, 2000. Chemistry of Bark, in Wood and Cellulosic Chemistry, Hon, David N.-S., and Shiraishi, Nobuo, (eds), CRC Press, pp. 243-2, New York. Siswadi; Saragih, Grace S., and Rianawati, Heny, 2013. Potential Distributions and Utilization of Faloak (Sterculia quadrifida R.Br 1844) on Timor Island, East Nusa Tenggara, Forest and Diversity: International Conference Proceedings, pp. 165-172, Manado Forestry Research Institute. Shah, Biren; and Seth, Avinash, 2012. Textbook of Pharmacognosy and Phytochemistry, Elselvier, New Delhi. Tepparin, Supaluk; Sae-be, Porntip; Suesat, Jantip; Chumrum, Sirisin; and Hongmeng, Wanissara, 2012. Dyeing of Cotton, Bombyx Mori and Eri Silk Fabrics with the Natural Dye Extracted from Tamarind Seed, International Journal of Bioscience, Biochemistry and Bioinformatics, vol. 2, no. 3. Tomlinson, Philip Barry, 1986. The Botany of Mangroves, Cambridge University Press, Cambridge. Umar, Ibrahim Abdullahi, 2013. Fastness Properties of Colorant Extracted from Tamarind Fruits Pods to Dye Cotton and Silk Fabrics, Journal of Natural Sciences Research, vol. 3, number 4, pp. 60-66. This webpage was first published on 22 February 2016.